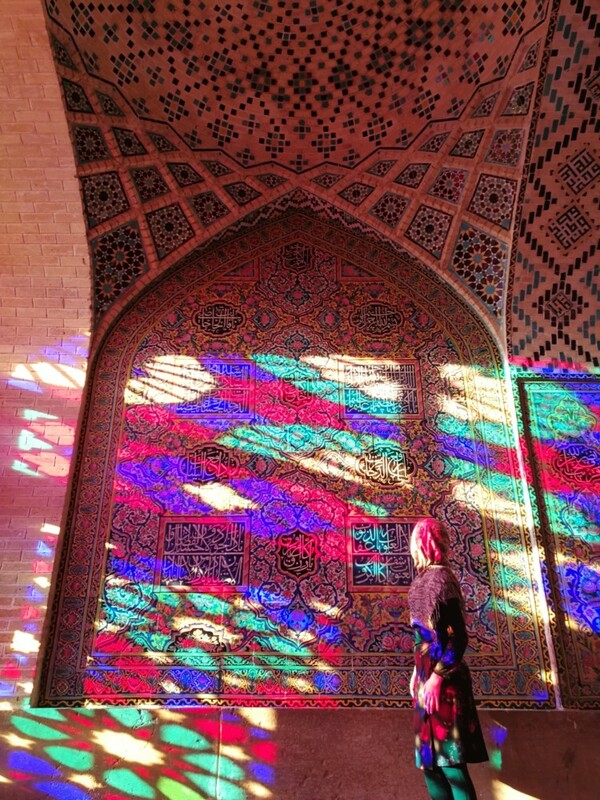 Iran is a magical country and I’ll never forget it! Whether hitchhiking through the rugged desert or chilling out on the crisp colorful sands of the island of Hormuz, there’s nothing like it! My favorite places are the islands (I didn’t even know you have any haha). 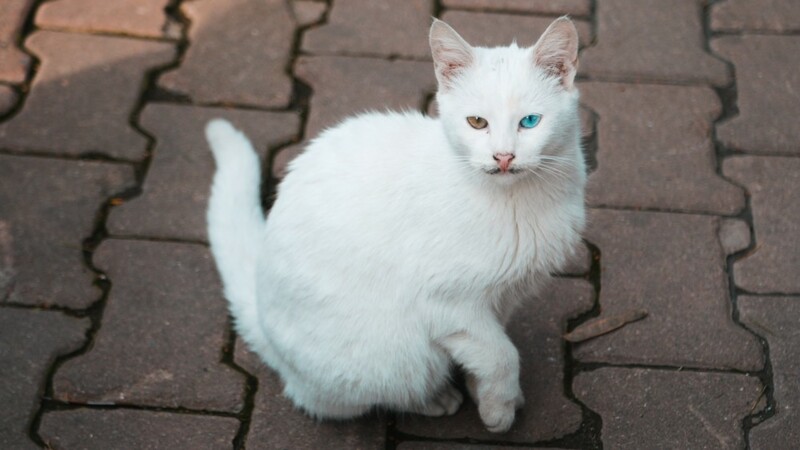 So beautiful and unique! Have you ever had your stuff stolen? WELL, this happened to me! 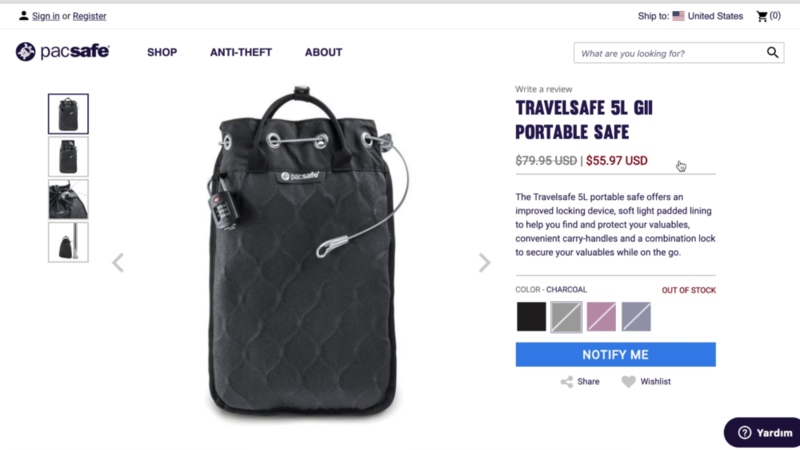 During my travel in the past years, I’ve learned a lot about staying safe – especially because people actually tried to rob me and I had my stuff stolen a lot of times. Even in my own home city. The place where I usually feel safe and confident. But sh*t happens and lessons learned! In this video and article I show you my 5 tips how I prevent myself from getting stuff stolen while hitchhiking, traveling solo and staying in hostels or doing Couchsurfing. Especially when traveling with a laptop or filming gear. I usually don’t give product recommendations, but I think for this article it’s very useful to mention my favorite things that I really trust when it comes to safety. And the RiutBag backpack is just the best thing ever. It totally changed my life and made everything just so much easier. You wonder why? I’ll tell you. 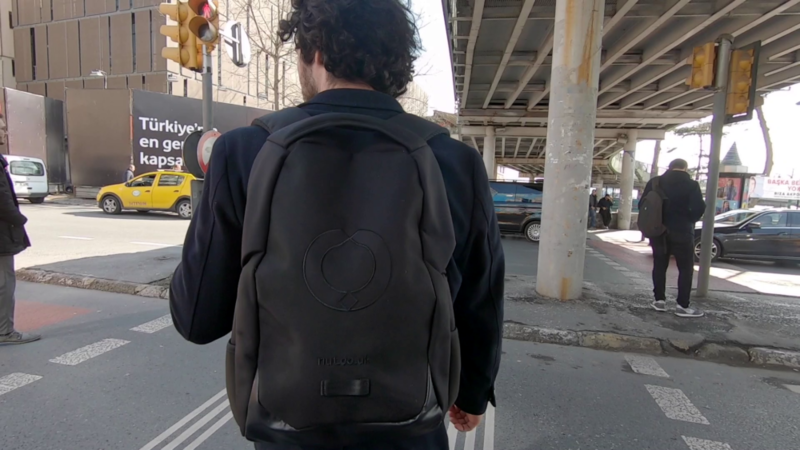 The best thing about this backpack is that it has no outer openings. It means all the zips are hidden against the back. So it’s impossible. Impossible. to open it while it’s on your back. It’s waterproof and It has enough space for my laptop and camera gear. And the best part: It just makes me feel comfortable wherever I go. Because I know that everything is really safe. Nobody can open it from the outside. And isn’t it the most frustrating thing when you realize that you got something stolen because someone opened your bag while you were in a crowded place? This happened to me a lot of times in the past. I think not only everyone should have a backpack like this one, but every backpack should be designed like this. So no matter if you’re traveling to a foreign country or if you’re commuting to work every day: Having a secure backpack is the most important thing! You can find different versions of the RiutBag on their website here. Another thing that I always use when I’m traveling is a belt bag. But not a big one, it’s important that it’s small and not visible to other people while you’re wearing it. There I’m hiding a part of my money, an emergency credit card, my keys or whatever. The most secure place is our body and we should always make use of it. 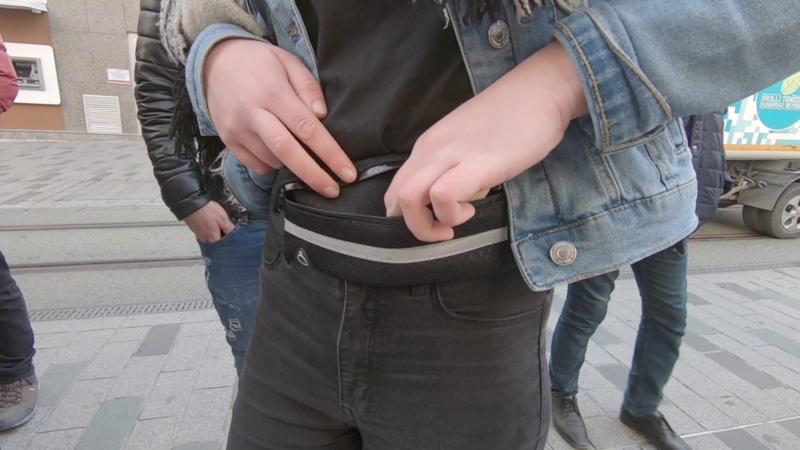 This belt bag is so thin that other people won’t even notice it when I’m wearing a dress over it or a T-Shirt. And I really just use it for the most important things. When I’m sleeping outside or in a train, it also has space to fit my phone in there. And this belt bag really makes me feel relaxed while sleeping in a public space or just having it on me all times. So if you don’t have a belt bag yet – get one! I learned the importance of locking up my valuables just on my recent trip. Not only ask a lot of hostels for a separate lock or charge an extra fee for that. The locks you get in hostels are also not necessarily that secure and can be easily opened by thieves. So that’s why I usually carry a simple but secure lock with me which is also useful to no only lock up storage, but also doors, your bags, your camera gear, drones and your pacsafes. 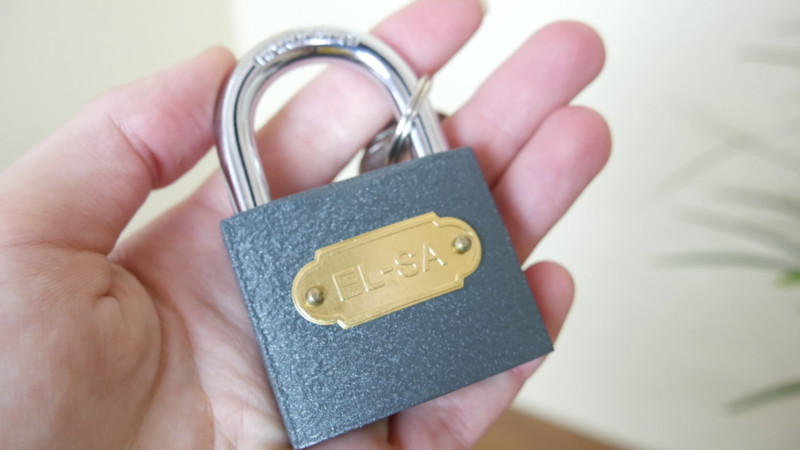 There are thousand different kinds of locks available on the market but I think choosing one that is not too heavy but also not too simple to open is a good choice and carrying it around won’t feel like a waste of weight. I know that people who really wanna open a lock will be able to open the lock. So keep that in mind but most of the thieves usually don’t plan to steal your stuff. It mostly just happens randomly by strangers who see that your stuff is not secured and easily accessible. So a lock will definitely prevent people from touching your stuff. Everybody should carry a dummy wallet while traveling for mainly two reasons. First: It is never a good idea to keep all your cash in one place. So having a second wallet makes real sense if you just keep a small amount of cash in there. So whenever you need change you know that you have this wallet and small notes are available. In some places where corruption is still a thing, it might help you as well to have a dummy wallet. So if a police officer stops you and wants some money from you for whatever reason, you can show him your wallet and he will maybe leave you with a smaller fine because you have not that much cash on you. For instance, this happened to me in Vietnam and Turkey and both times the officers didn’t want to make big trouble either and let me go. Second: The second reason why traveling with a dummy wallet is a good idea is because if someone tries to steal your wallet or even wants to rob you. You can hand this wallet over and it won’t be that big of a deal. You won’t lose that much money and it maybe saves your life to cooperate with someone trying to rob you. This is something I don’t own yet but it’s definitely on my list. I was looking for something to lock up my laptop or camera gear while going out at night or when there is no locker available and you don’t wanna carry your laptop with you all the time. The idea is to have a small bag that is as secure as a safe. So I stumbled upon this website and I read really good recommendations about their products. What’s definitely on my list is the Travelsafe which is basically a portable safe but it doesn’t necessarily look like one. I think this will be very useful when traveling in hostels that do not have safes. On my last trip, I was a little bit worried about my laptop sometimes because it happened that there was no storage available and I had to hide it under my pillow. Anyway, this travelsafe is Almost like a small backpack and you can just lock it on the bed, around a tree or wherever and it’s really really hard to open it even with the right tools. Traveling is fun and life-changing. But it doesn’t mean that travel can’t be frustrating, or that accidents can’t happen. You always need to be careful when it comes to your safety and your money. Which is exactly why I wrote this article and why I made this video. So I hope your next travel will be safe and see you next time! 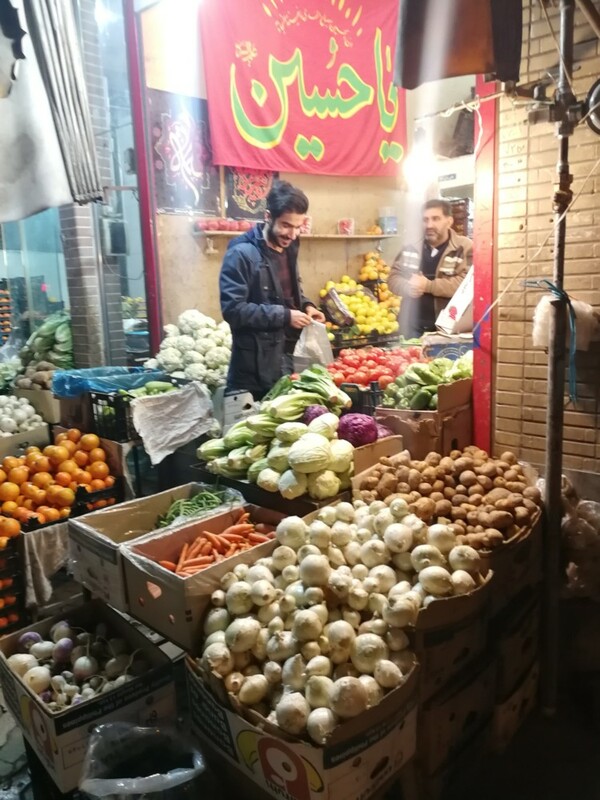 I was really excited to go to Isfahan – to the “half of the world”, because every book and every website mentions Isfahan as THE to go place in Iran. No traveler should miss that city. Unfortunately I just arrived at night in the hostel and the next day it rained non-stop. So I decided to take it easy, stayed in the hostel and edited some videos. It is okay to just not go outside and be active the whole time, especially when you are on the road for a few weeks. This made me even more excited to go out and spend the whole day exploring after my short break and rest time. And I didn’t get disappointed! 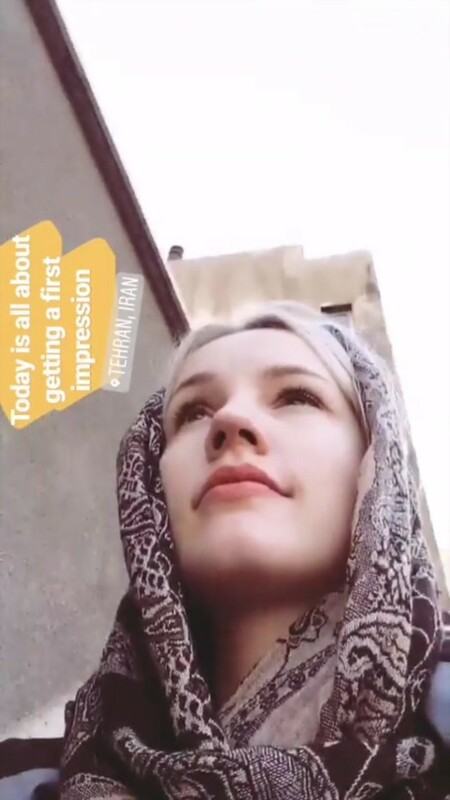 It was a beautiful day spent in Isfahan and I visited the big square, the mosque, a traditional tea house, the Chehel Sotoun Palace, the bazaar and of course the bridges. Nowadays the river is not flowing anymore and instead, there is only a lot of sand left. Even it looks sad it was still fun to walk on the “river”. At the big square I got a little bit annoyed by all the Iranian tour guides that talked in German with me and tried to sell me a tour or a “free tea” in their bazaar shop. It also happened that a few youngsters talked to me about Hitler and how much they like him because he was a powerful man. I tried to make them understand that I don’t agree with them but I guess that didn’t change their minds. 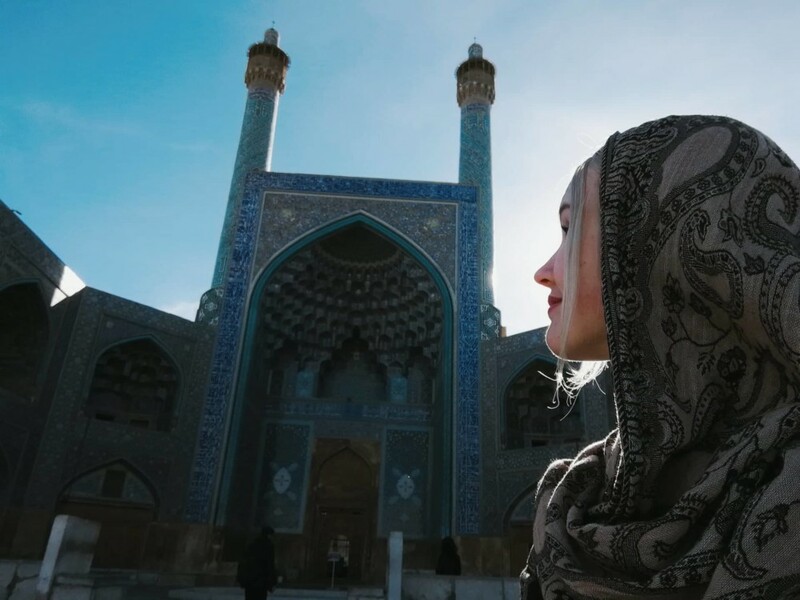 However, Isfahan is beautiful and has a lot of attractions, but for the first time during my trip I felt a negative impact of the tourism industry and I’m afraid that it won’t get better but worse. 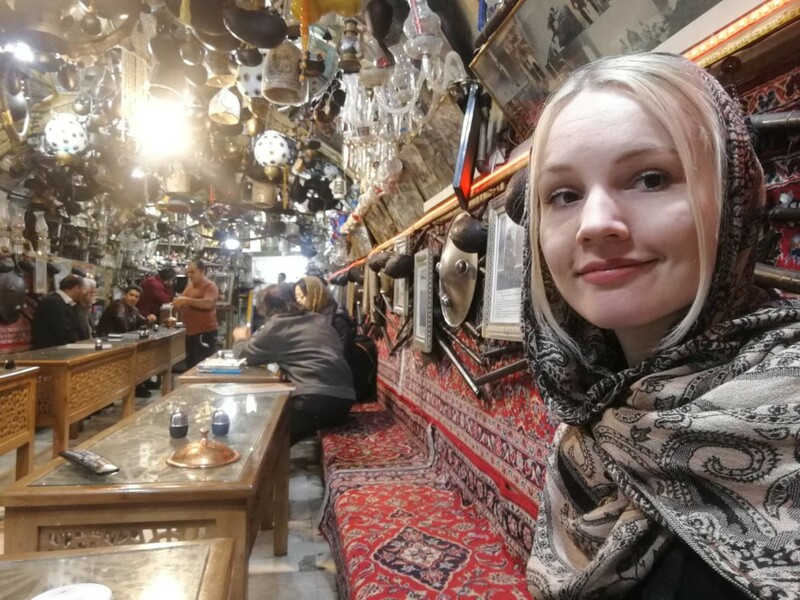 I know there is a lot of desert in Iran and I expected to visit it during my stay in Kashan BUT then I fell in love with the small city itself and the Abyaneh Village which is not too far from Kashan. 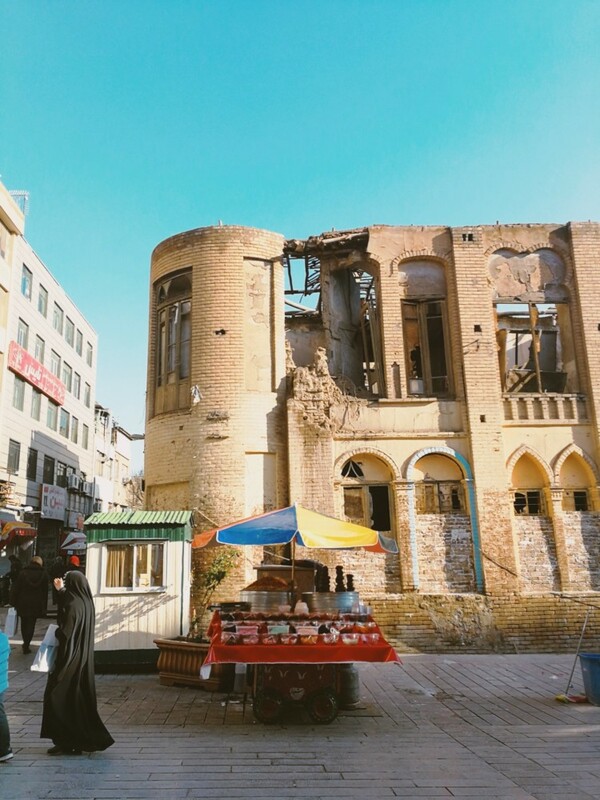 What I liked most about Kashan was that it is not so crowded like all the other touristic cities and of course that it has its own desert atmosphere. I always wondered how it is to be alive thousands of years ago. 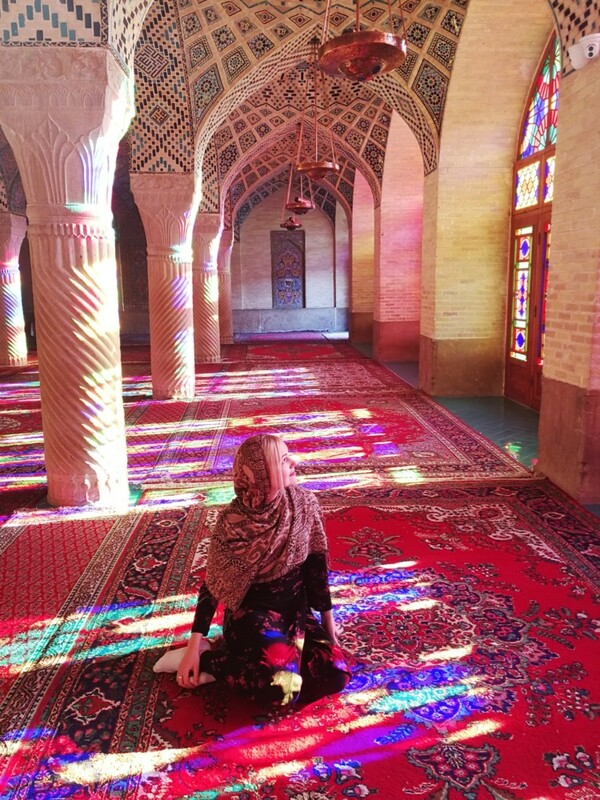 Kashan is a magical city that exactly makes you feel like you are in a different time and offers much more than only the desert. There are a lot of traditional houses to explore where you can get lost and stroll around for hours. In my head I imagined how the people were living here hundreds of years ago, what kind of discussions they had and how they furnished their houses. These places will definitely play with your fantasy. And of course there is Kashan’s historical mosque and the traditional bazaar which offers you a perfect spot for an Iranian breakfast. If you ever wondered how the most beautiful historical garden of the Middle East looks like then you shouldn’t skip going to Fin Garden. It’s a place to relax and not too far from the city. 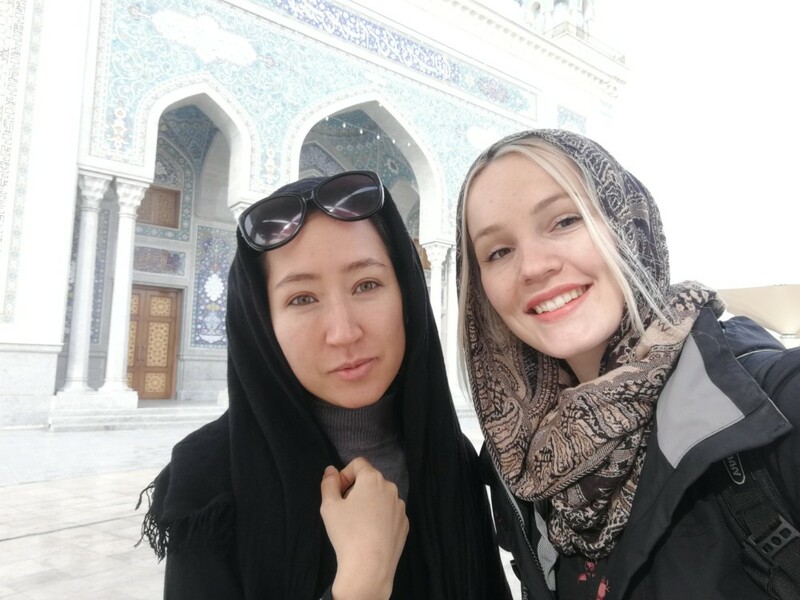 Although there are so many sites in Kashan that are impressive and just beautiful I didn’t see a lot of travellers and most of the time I was the only person visiting a site. It seems that the city is still quite undiscovered by tourists which makes it a great time to visit right now. 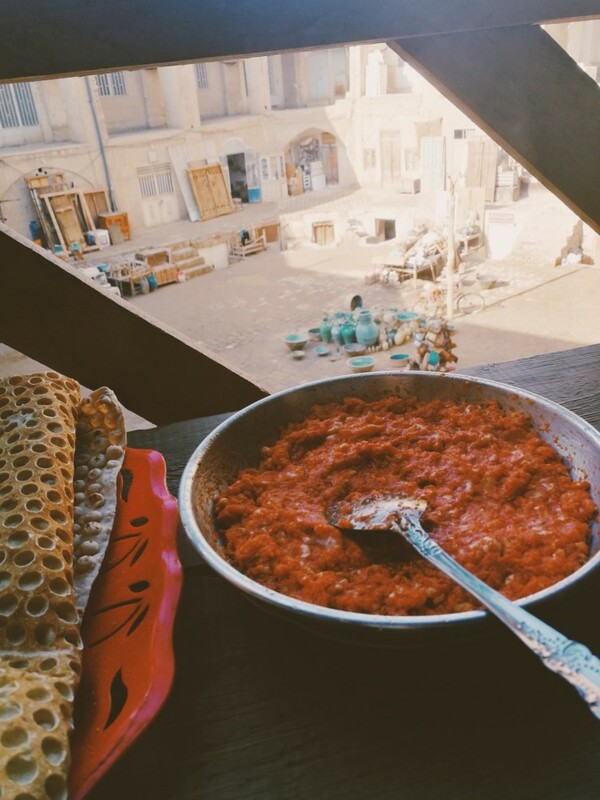 On the other hand there is the abyaneh village which attracts more people due to it’s unique historical charme. This village is one of the oldest in Iran and has been called the window to Iranian history and people also say that it’s a living museum. It’s a really picturesque city and the locals seem like really cool people as well. 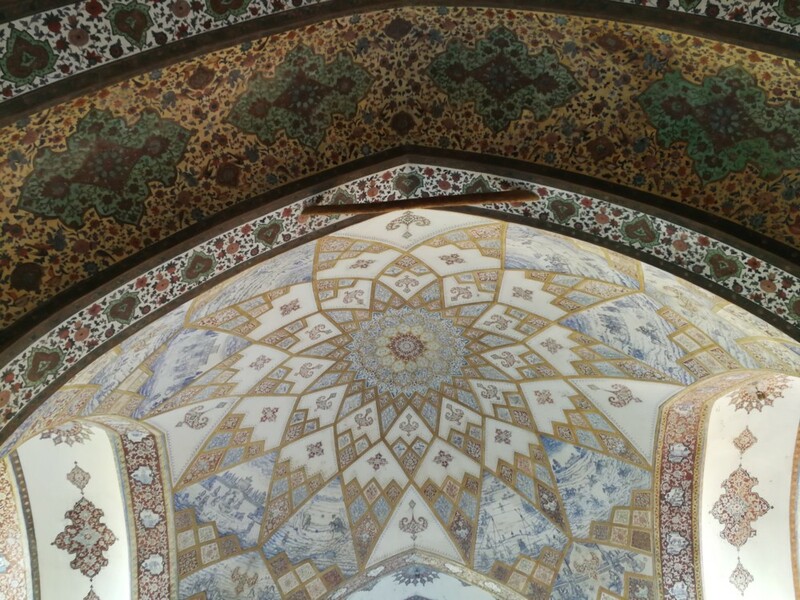 After a comfortable 2 hour bus ride from Qom I arrived in Kashan. 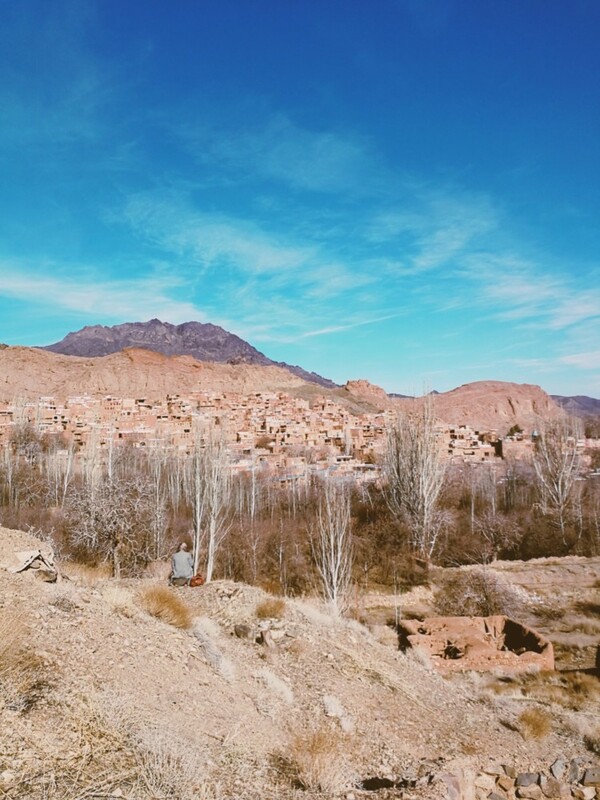 This small city is known for its traditional houses and trips to the manjabi desert. 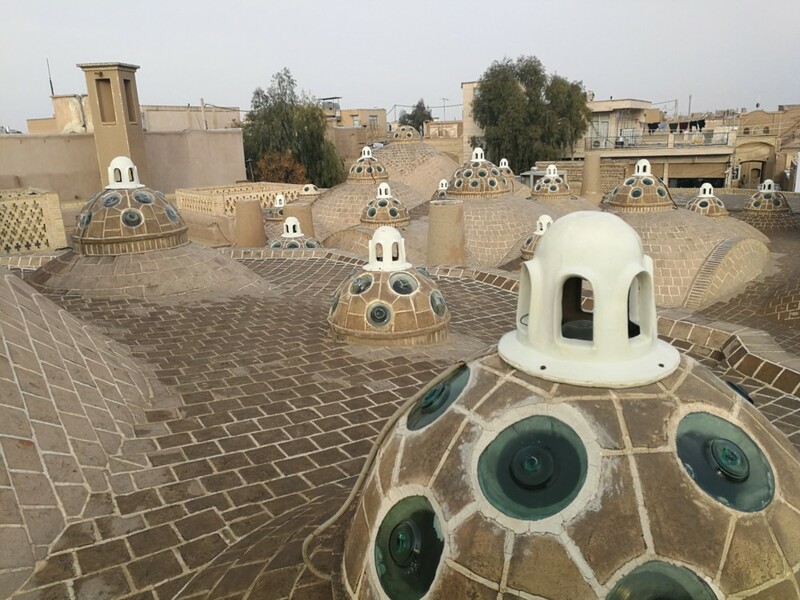 Kashan is a beautiful small town with some great historical places like a traditional bath house or its over 400 years old mosque in the center of the city. Unfortunately I wasn't able to visit the desert but I had a lot of fun discovering the town and talking to some local people. 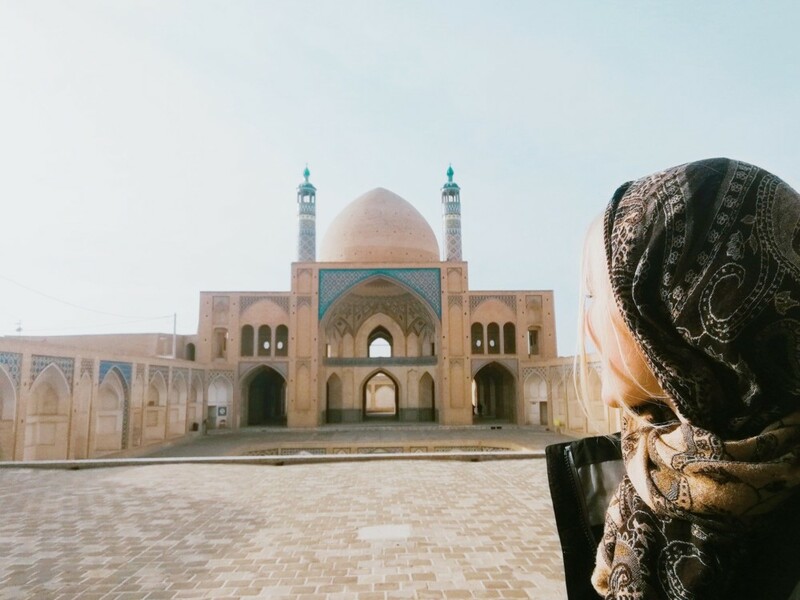 What I love about Kashan is that it's really quit and the fact that you won't meet a lot of people in most of the tourist attractions. 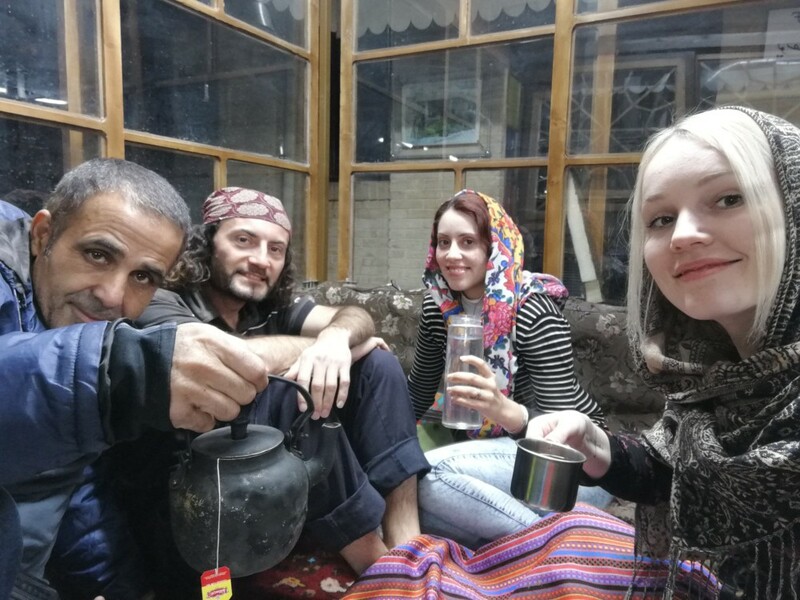 Iranians love drinking tea no matter where they are. This picture was taken at 11pm inside a car. 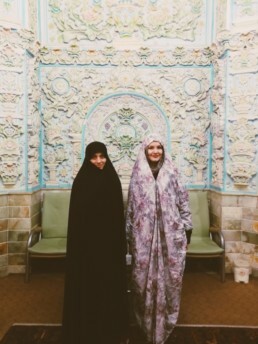 Qom is a very important and holy city for most Iranians, not so much for tourists. So when I said that I’m going to Qom I got some confused looks and people asked me why would I go there. I didn’t really know but then I quickly realized that it’s definitely worth a visit! 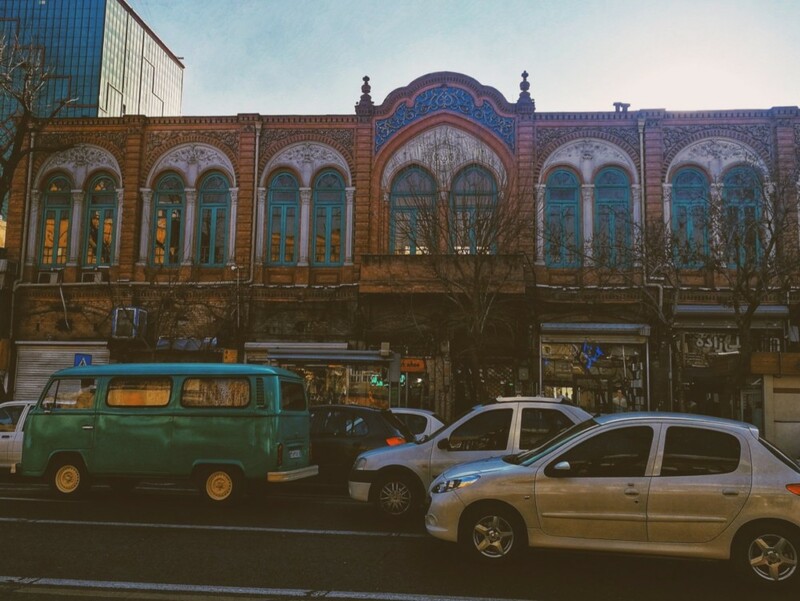 Qom has some really great architecture and beautiful buildings. The holy shrine is one of the most impressive buildings in Iran and a lot of pilgrims come here from all around the world. First I was unsure if I could just go there or if my dress code was appropriate, but then locals were really friendly and showed me where to go. Tourists enter on entrance 17. Inside the entrance your bag gets checked and in my case they cave me appropriate clothing. The women were so nice to me! They gave me chocolate and organized a tour guide for me who showed me around. 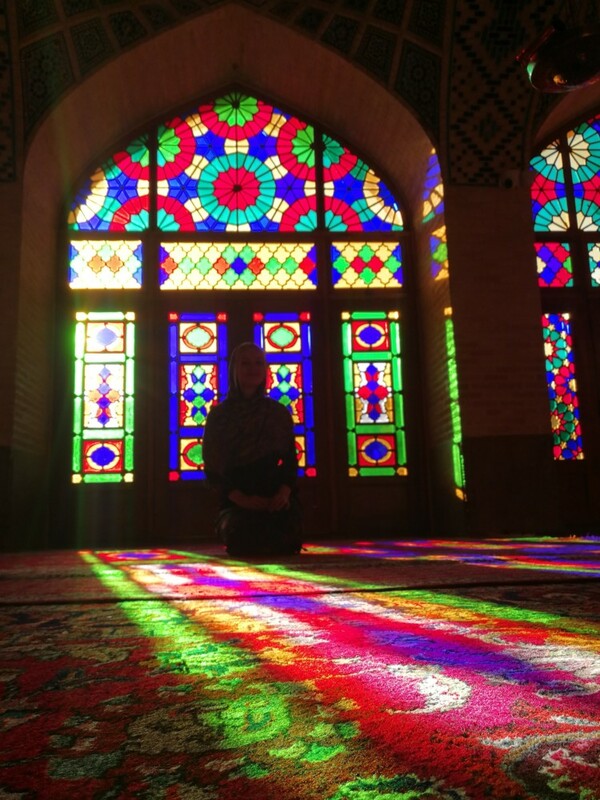 After the holy shrine I walked to the mosque nearby and an afghan girl talked to me. We took a picture together and talked a while. It’s heartwarming how friendly everyone is and that they are curious about their visitors. 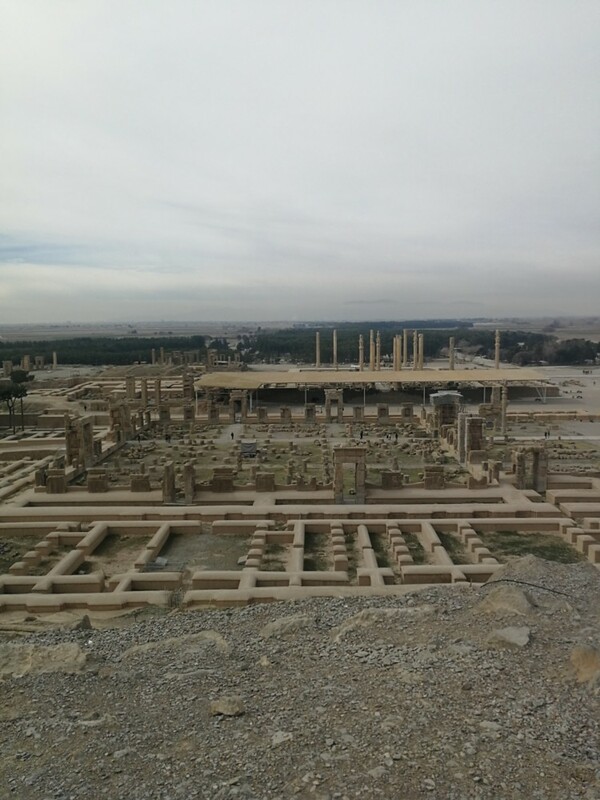 Qom was definitely a great experience and Im glad I decided to got there. 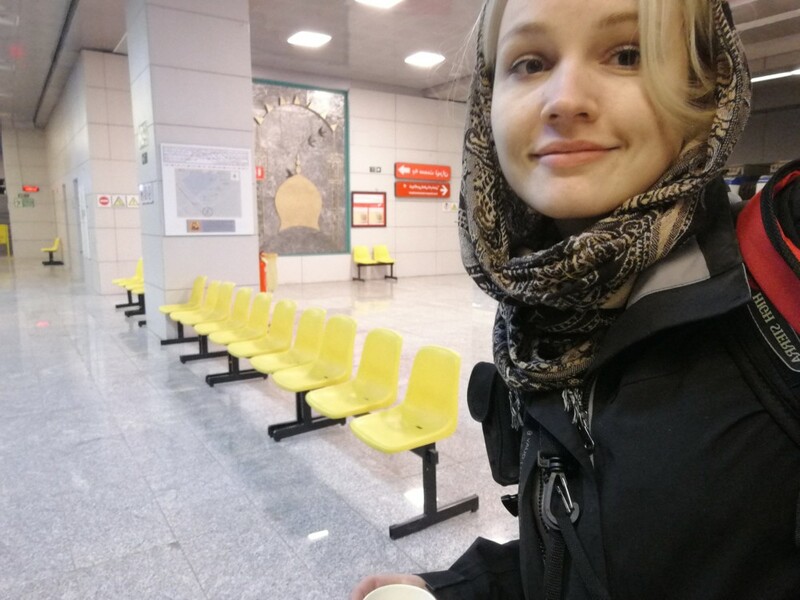 After a really short and sleepless night I arrived at Tehran's International Airport. 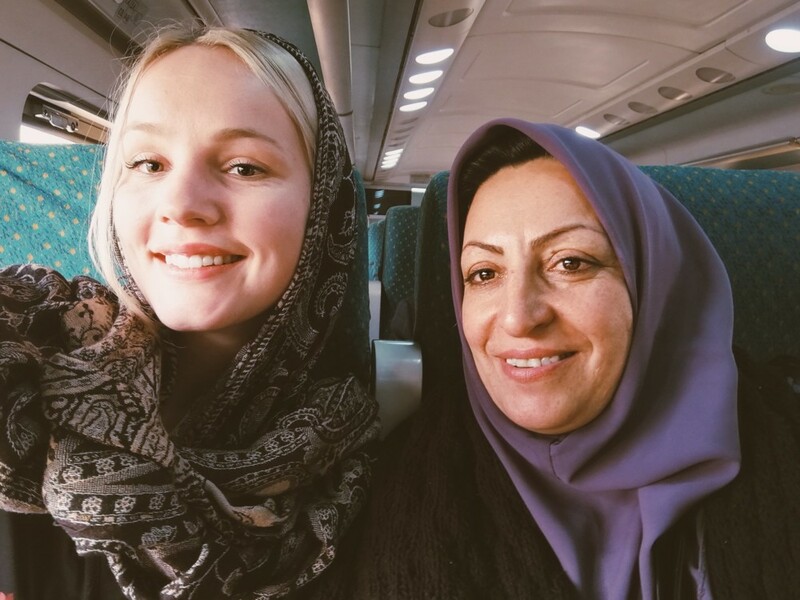 As soon as we landed all the women took on their head scarf and it was like a different world just opened up in front of the plane. 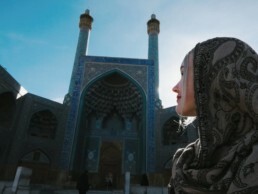 Luckily I obtained my evisa for Iran before and was able to just pass easy peasy going the immigration. Nevertheless it was really early (4am) and the first metro wouldn't go before 7am. Exploring the arrival hall was kind of a nerve wrecking thing as taxi drivers didn't leave my side and even followed me to upstairs. There were also a lot of men who tried to exchange my money on the black market but I preferred to use the official money exchange at the airport. I was just really really confused and still didn't figure it out. 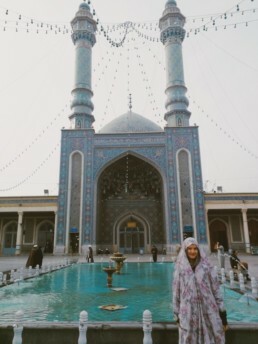 Tomorrow afternoon I'll be heading to the most religious city of Iran: Qom! Before you start your online application make sure that you have all the necessary information to complete it 100%. Click here to get forwarded to the list of documents and information you will need. 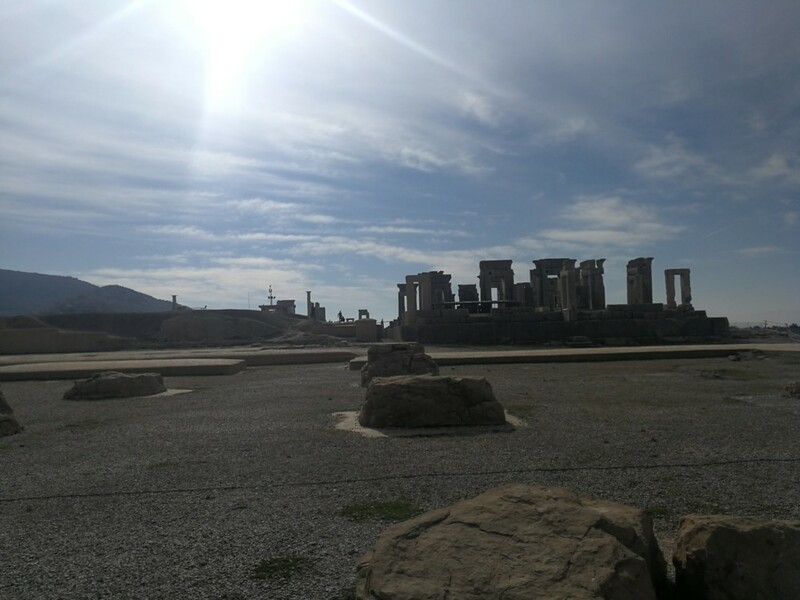 I made sure that I had a flight and hotel (for the first night) booked in advance so that I could provide an Iranian address for my stay as well as a phone number and flight dates. They also need a digital photo copy of the passport and a personal photo with specific measurements. I made the photo by myself and resized it with a photo editing tool. The personal photo must be in a ratio of 4:6 and equal or less than 500kb in file size. The passport copy must be in a ratio of 8:6 and equal or less than 500kb in file size. Do women need to wear a headscarf on their visa photo? No, but it will lower the chance of getting rejected. 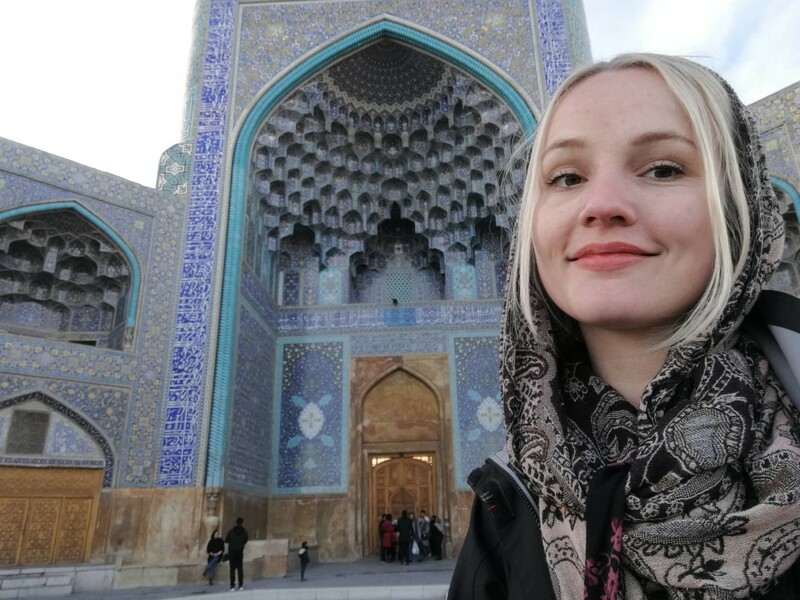 In my case I didn’t cover my hair on the photo (and I’m bright blonde) and got accepted after 2 days, but surely it can depend on the person who is checking your visa application. Check their photo page for updated information! Bevor man mit der Online-Bewerbung beginnt, sollte man sicher stellen, dass man für den Visumsantrag alle erforderlichen Informationen verfügt. Klicke hier, um zur Liste der Dokumente und Informationen zu gelangen, die man benötigt. 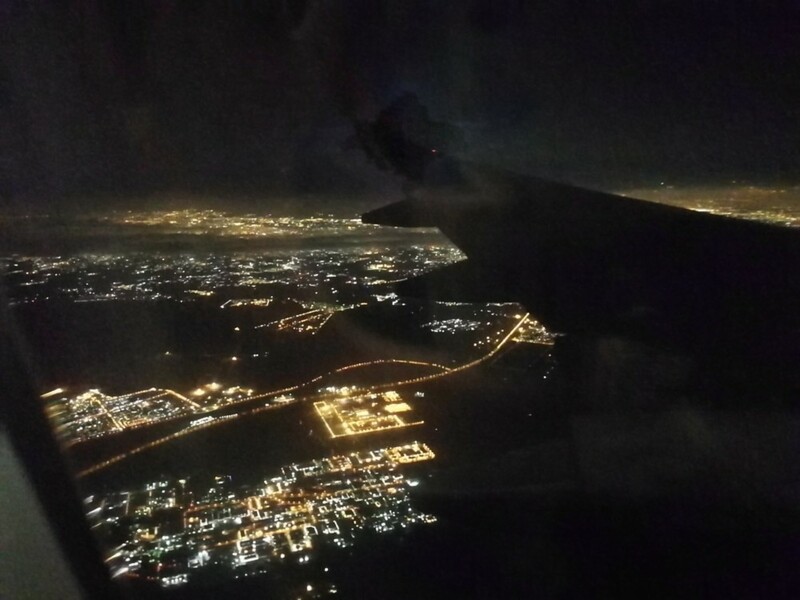 Ich stellte sicher, dass ich einen Flug und ein Hotel (für die erste Nacht) im Voraus gebucht hatte, sodass ich eine iranische Adresse für meinen Aufenthalt sowie Telefonnummer und Flugdaten angeben konnte. Außerdem benötigt man eine digitale Fotokopie des Passes und ein persönliches Foto mit spezifischen Maßen. Ich habe das Foto von mir selbst gemacht und mit einem Fotoprogramm angepasst. Das persönliche Foto muss ein Verhältnis von 4:6 und eine Dateigröße von maximal 500 KB haben. Die Passkopie muss ein Verhältnis von 8: 6 und darf ebenfalls nicht größer als 500 KB sein. Müssen Frauen auf ihrem Visumfoto ein Kopftuch tragen? Nein, aber es verringert die Chance, abgelehnt zu werden. In meinem Fall habe ich meine Haare auf dem Foto nicht bedeckt (und ich bin hellblond) und wurde nach 2 Tagen akzeptiert, aber es kann sicherlich von der Person abhängen, die den Visumantrag prüft. Hier geht’s zu den aktuellen Informationen der MFA Webite. Make sure that you have a stable internet connection and preferably fill in the form on a computer and not on your phone as you should print the final page for further process. Click here to get forwarded to the official E-Visa online registration form. Filling in the form is easy and takes no longer than 10 minutes. They ask for your closest Iranian consulate and the length of your stay. For me it was the Irian Consulate in Istanbul and I asked for a stay of 27 days. 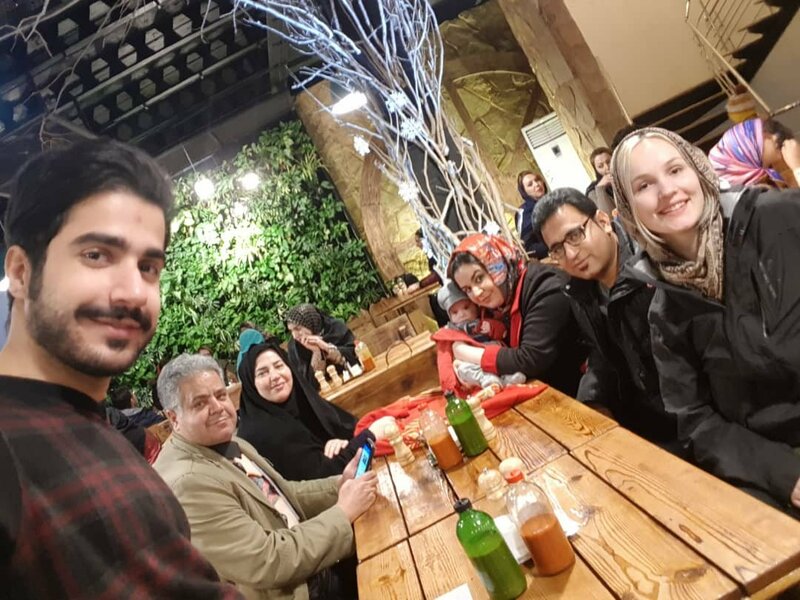 After submitting the application it says to go to the nearest Iran consulate as soon as possible to hand in the original documents. In my case I waited a few days and got accepted without showing up beforehand. So I think it will be a waste of time to go there before it got accepted. But if your application is in review for more than a few days I would show up and ask for the status. Man sollte sicher stellen, dass man über eine stabile Internetverbindung verfügt und das Formular vorzugsweise auf einem Computer und nicht auf einem Telefon ausfüllt, da man die letzte Seite für den weiteren Vorgang ausdrucken sollte. Klicke hier, um zum offiziellen Online-Anmeldeformular für das E-Visa zu gelangen. Das Ausfüllen des Formulars ist einfach und dauert nicht länger als 10 Minuten. 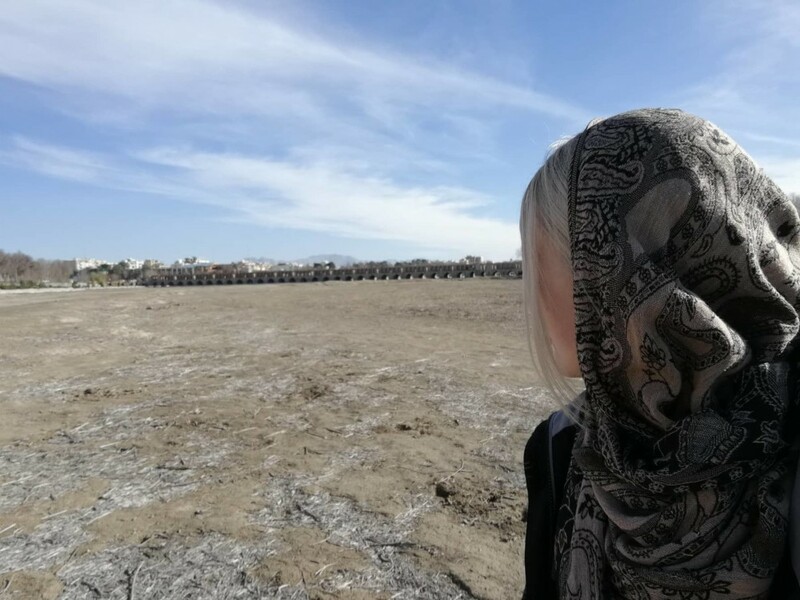 Es wird nach den nächstgelegenen iranischen Konsulat und nach der Dauer des Aufenthalts gefragt. 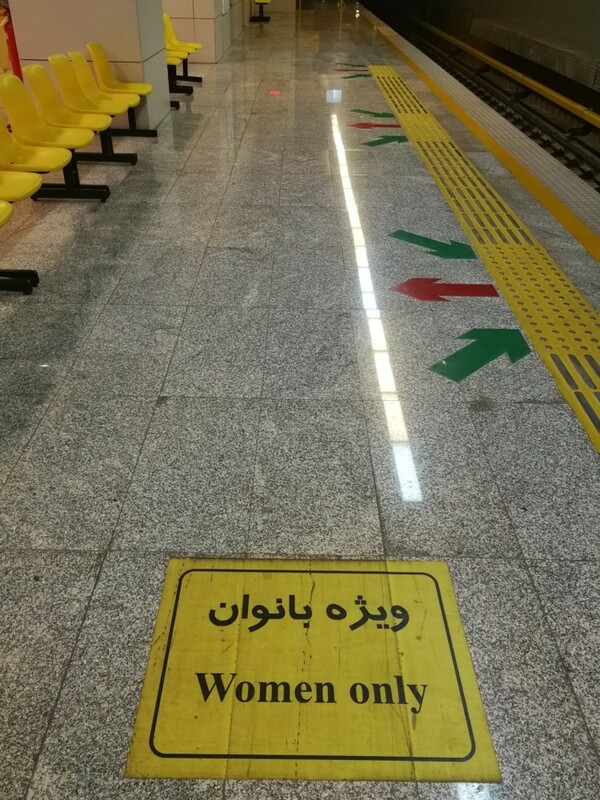 Für mich war es das iranische Konsulat in Istanbul und ich habe einen Aufenthalt von 27 Tagen angefragt. Nachdem man das Formular ausgefüllt hat, kommt eine Meldung mit dem Hinweis zum nächstgelegenen iranischen Konsulat zu gehen und die Originaldokumente einzureichen. In meinem Fall habe ich ein paar Tage gewartet und mein Visum wurde genehmigt, ohne vorher im Konsulat gewesen zu sein. Ich denke, es wäre Zeitverschwendung dorthin zu gehen, bevor man entweder angenommen oder abgelehnt wird. Wenn der Status jedoch nach ein paar Tagen immernoch in Bearbeitung ist, würde ich mich im Konsulat melden und nach dem Status fragen. After 3 days my visa application got approved. I applied on a Thursday and it got approved on Saturday. So after that I printed my application form and went to the nearest Iranian Consulate (in my case in Istanbul) with my passport. 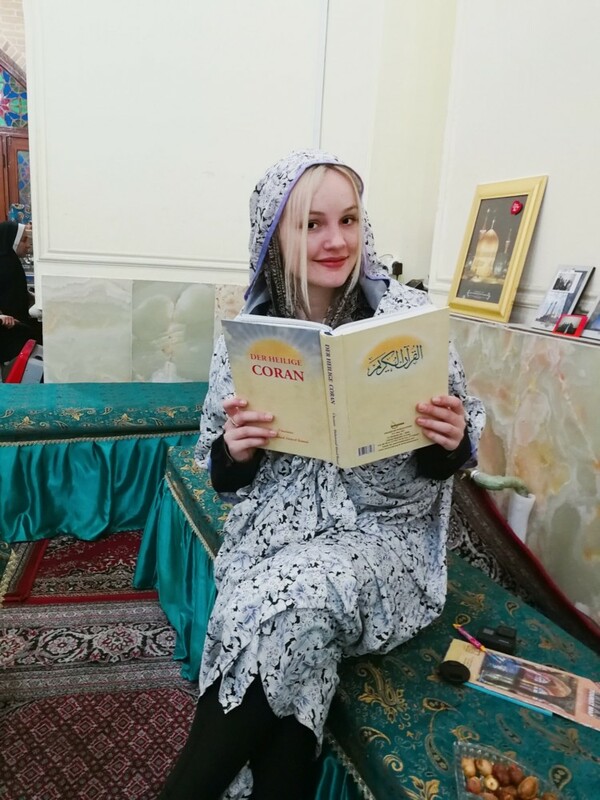 I can just tell you about my experience with the Iranian Consulate in Istanbul as I made a few mistakes and wish I knew them before I went there. First of all, the website and the application letter gave wrong information about the opening hours of the consulate. So I went there at 8 am to find out that it opens at 8:30 am and then got rejected because visa issues will only be handled between 2-3:30pm. So after waiting for 1 hour to get called to the visa counter I figured out that they play “first in time, first in line”. So don’t wait. The “visa room” is divided by a glass door and there is one counter where all the people wait to speak with one officer. Just go to the counter and hand over your passport and your approved visa application letter. After that you will get a piece of paper with an Iban Number and the amount of money you have to pay for the visa. In my case (German citizen) it was 50 EUR. So after the officer gives you this paper he won’t tell you where to pay 😀 After being confused for a while I found out that I have to leave the consulate to go to the nearest bank and pay there. They only accepted cash money, but all in all, it was an easy process. Just confusing to leave the consulate and walk to the bank. After you paid the banker will give you a receipt of your payment. After that, you go back to the consulate and hand in your passport and the receipt. Then he will give you a piece of paper that tells you when to come back to collect your passport and visa. In my case it was 5 working days later. Nach 3 Tagen wurde mein Visumantrag genehmigt. Ich habe mich an einem Donnerstag beworben und am Samstag wurde es genehmigt. Danach habe ich direkt mein Antragsformular ausgedruckt und bin mit meinem Pass zum nächstgelegenen iranischen Konsulat (in meinem Fall in Istanbul) gegangen. 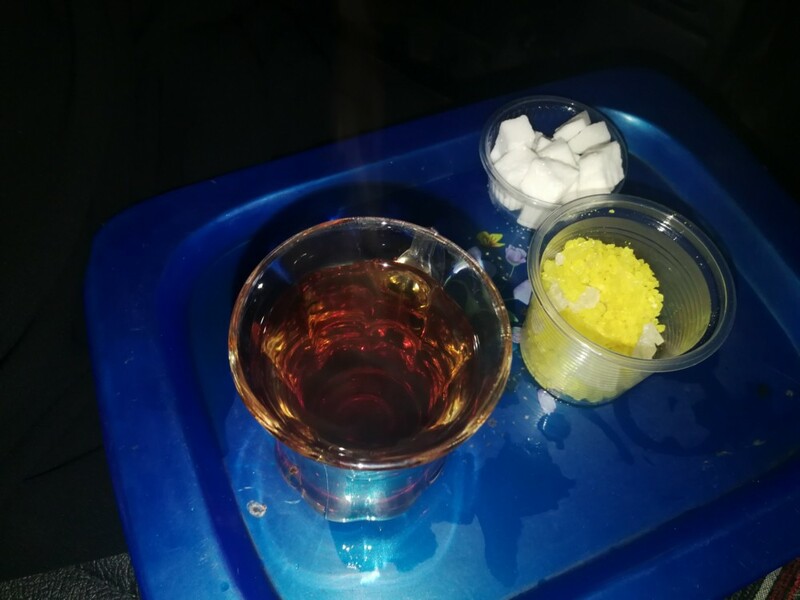 Ich kann also nur von meiner Erfahrung mit dem iranischen Konsulat in Istanbul berichten. Ich habe ein paar Fehler gemacht wünschte, ich hätte davon gewusst, bevor ich ins Konsulat gegangen bin. Zunächst einmal gab es keine oder falsche Angaben zu den Öffnungszeiten des Konsulats auf der Webseite, sowie auf dem Visa-Antragsformular. Ich bin also um 8 Uhr morgens dorthin gegangen, um herauszufinden, dass es um 8:30 Uhr öffnet und wurde dann wieder nach Hause geschickt, da Visa-Angelegenheiten nur zwischen 14:00 und 15:30 Uhr bearbeitet werden. Nachdem ich also 1 Stunde gewartet hatte, um mit meiner Wartenummer zum Visumschalter gerufen zu werden, habe ich festgestellt dass es hier nach dem Motto “wer zuerst kommt, mahlt zuerst” abgeht. Also nicht warten, bis man aufgerufen wird. Der “Visumsraum” ist durch eine Glastür getrennt und dort gibt es einen Schalter, an dem alle Leute warten, um mit einem Beamten zu sprechen. Man muss also einfach zum Schalter gehen, sich ein bisschen durchdrängeln und den Pass und das Visaformular durch die Luke geben. Danach hat mir der Beamte ein Stück Papier mit einer Iban-Nummer und den Betrag, den man für das Visum zahlen muss, gegeben. In meinem Fall (deutscher Staatsbürger) waren es 50 EUR. Nachdem der Beamte also diesen Zettel gibt, sagt er auch nicht wirklich was man damit machen soll 😀 Nachdem ich einige Zeit verwirrt war, habe ich dann herausgefunden, dass man das Konsulat verlassen muss, um zur nächsten Bank zu gehen und dort zu bezahlen. In der Bank akzeptierten sie nur Bargeld, aber alles in allem war es ein einfacher Prozess. Es war nur sehr verwirrend, das man das Konsulat verlassen musste, um zur Bank zu gehen. Nachdem man bezahlt hat, erhält man eine Quittung über die Zahlung. Danach geht man zurück zum Konsulat und gibt seinen Pass und die Quittung ab. Dann bekommt wieder einen Zettel auf dem steht, wann man zurückkommen soll, um den Pass und das Visum abzuholen. In meinem Fall waren es 5 Arbeitstage später. 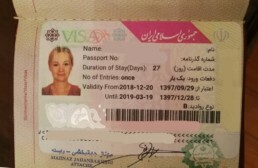 Do women have to wear a head scarf on the visa photo? 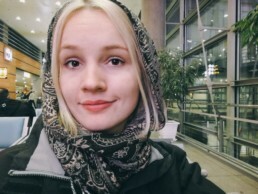 In my case, I did not wear a headscarf on my photo and got easily approved for the visa. Anyways, I would not take the risk and just put a photo with a headscarf. You never know which officer looks through your application and it may differ from person to person! It depends from case to case, where you apply and which nationality you have. In my case it took 8 working days from applying to getting the visa in my passport. Make sure to apply around 1 month before your travel to have enough time. If my e-visa gets rejected, can I apply multiple times? Yes, it’s possible to apply as many times as you want. Sometimes they reject with the reason: please apply through a travel agency. In this case I would go with a travel agency that can organize your visa. Yes! 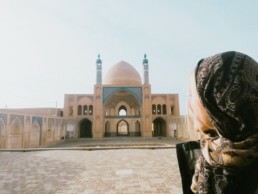 It’s obligatory to have valid travel insurance while traveling in Iran and it’s definitely advised. 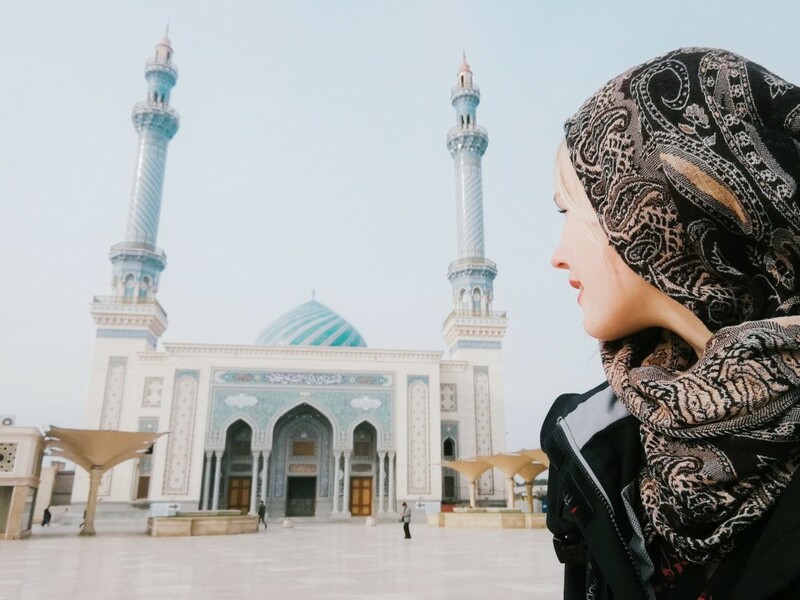 It’s possible to buy a travel insurance at the airport of Tehran or just make sure to print your existing travel insurance which states that it’s valid in Iran. 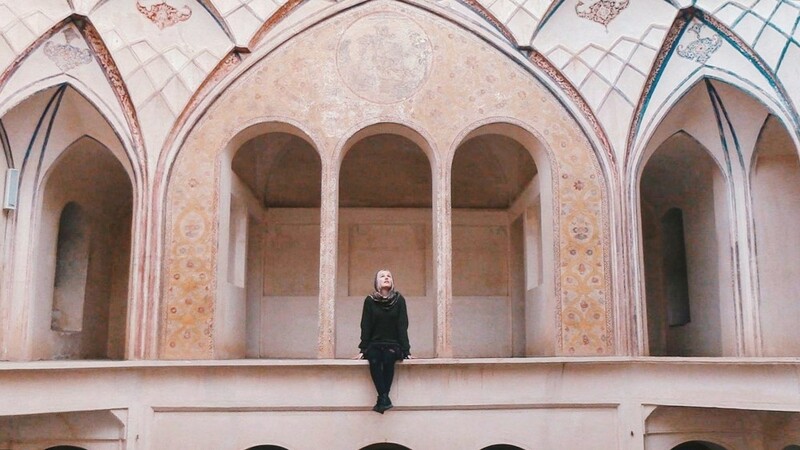 Click here to find out more about my 4-week travel in Iran as a solo female traveler! The first time I came to Istanbul was back in 2012 and since ever then I love love love this city! It has its very own charm. 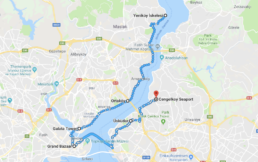 The Bosphorus, the vibrant nightlife, Turkish traditions and people from all over the world that live here make it to one of my favorite cities. And it’s never getting boring here! Das erste Mal, dass ich nach Istanbul gekommen bin, war 2012 und seitdem liebe ich diese Stadt! Sie hat ihren ganz eigenen Charme. 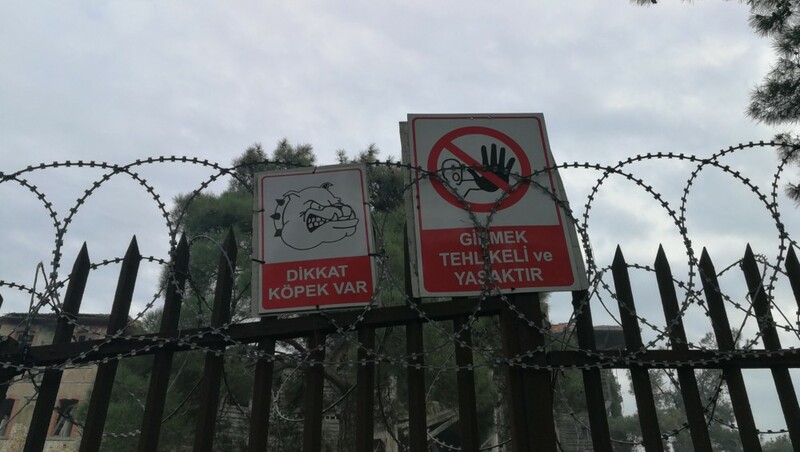 Der Bosporus, das pulsierende Nachtleben, die türkischen Traditionen und Menschen aus aller Welt, die hier leben, machen Istanbul zu einer meiner Lieblingsstädte. Und hier wird es nie langweilig! Contrary to the belief of a number of people, the Philippines is not only limited to the traffic jams of Manila. There is so much more to it. The Philippines has 7,107 islands to choose from. Do you want to experience life by the beach? Do you want to conquer the highest peaks in the country? Do you want to walk the busy streets of the concrete jungle? Name it, and the Philippines has it. And because it is made up of thousands of islands, there are so many options and so many activities that you can do. If you’re planning to travel around Southeast Asia, you must not ignore the Philippines. Not convinced? Here are 25 things that might change your mind. as it maintains an average temperature of 26.6°C all year round. There are no extreme hot or cold temperatures, so your body won’t have to adjust too much. Plus, you can get to enjoy a vacation at the beach any time of the year. that easily resemble the tropical paradise of your dreams. Nothing will beat the feeling of ditching your flip-flops as you sink your toes into the fine white sand. Add in the pristine water and laid-back vibes, you might never want to leave. While there are beaches that are already known to many, there are even more of unspoiled beaches in the country. Here, you will find serenity and be able to relax without unwanted noise from other tourists. 4. There are pink beaches in the Philippines too! You don’t need to go to Harbour Island in Bahamas, Balos Bay in Greece, or Spiaggia Rosa in Sardinia, because this tropical country in Southeast Asia is also a home to a few rose-tinted sand beaches. They are a bit harder to find than the white sand beaches, but they will definitely be worth the trip! 5. Ever swam with sea turtles? If the beautiful beaches aren’t enough to convince you to visit the Philippines, you have to know that you can swim with sea turtles, locally known as “pawikan,” as well. It’s not every day that you get to do swim alongside these magnificent animals, so you might as well grab the chance while you can. Have you tried swimming with a creature that is as big as a bus? You can do that in the Philippines. Swimming with whale sharks is quite a popular tourist activity in the country. 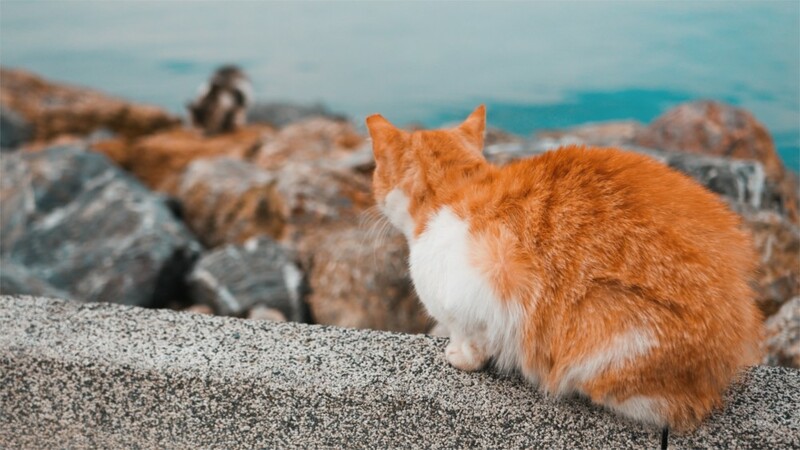 Although it has become quite controversial as these gentle giants are being fed by humans in Oslob, Cebu, which alters their food hunting habits, there are a few other places where they are able to roam and hunt freely. 7. Ever heard of a sardine run? No, sardines don’t run. They swim. And you can swim with millions of them in Moalboal, Cebu. What’s even amazing about it is that you won’t have to swim that far or dive too deep to see them because the sardine run takes places just a few meters off the beach! As the Philippines is surrounded by the Celebes Sea, the Philippine Sea, the South China Sea, and the Pacific Ocean, you are guaranteed to find great surfing spots in various parts of the country. that boast of rich marine life, such as various species of sea creatures and vibrant beds of corals. Many people from different parts globe visit the country to just to see these for themselves. the Philippines has got you covered. Partying in the club is one thing, but dancing the night away by the beach is a totally different story. in the Philippines as it has a multitude of mountains, hills, and volcanoes. In some areas, camping is allowed. You can lay under the stars, breathe the fresh air, listen to the sounds of nature, and if you’re lucky, even capture a Milky Way sighting or a shooting star on your camera. small and big. Even the island of Cebu alone has 90. So, you are bound to find one almost wherever you go. and you can witness this in multiple areas in the Philippines. A hike is required, obviously, but all the steps you make will be worth it when you find yourself standing above the clouds. Not directly, of course. While there are also many spots in the world where you can get a beautiful view of the sunset, even when you’re just driving along the road, seeing the sun go down into the spotless horizon will give you an entirely different experience. The Puerto Princesa Subterranean River in Palawan is an 8.2-kilometer navigable river, which flows into the South China Sea. Tours last about 45 minutes to an hour and are usually pre-booked. 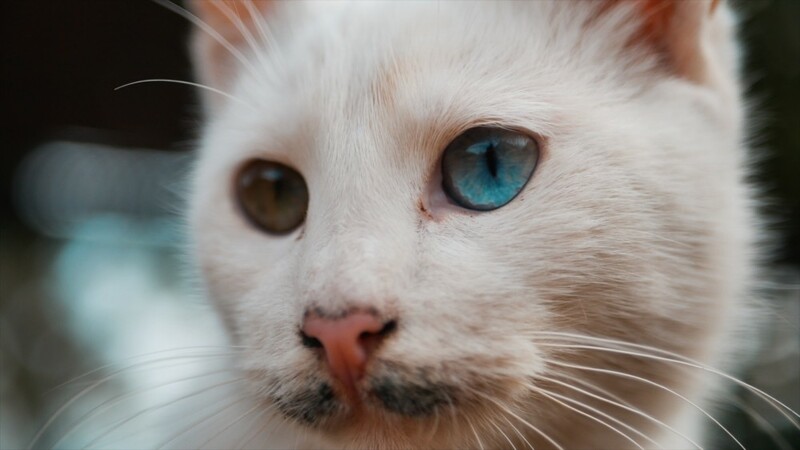 which are just as beautiful, but also different, as the ones in Nepal, China, and Indonesia. in different parts of the country all year round. Locally known as “fiesta,” people gather in their respective towns to witness their annual celebrations. Some festivals are in honor of religious figures and folklore, while others are nature-related. Being a predominantly Catholic nation, the Philippines is a home to a plethora of beautiful churches. A number of these have been standing for hundreds of years, with some housing centuries-old relics. Being a home to about 200 endemic birds, the country is also a known migration spot for birds coming from other countries, like Japan and Taiwan, during winter time. For the adrenaline junkies, there are a wide variety of heart-pumping activities that you can do while in the country. One of these is tandem skydiving. Forget about the drones, see the aerial view with your own eyes. which are tiny nocturnal primates that live in dense forests. There are many of them in the island of Bohol. However, these six-inch cuddly-looking creatures are already endangered, so you must not miss the opportunity to see while you still can. When traveling around the Philippines, your money will go a long way. From the food to booze to tour packages, almost everything is affordable in the Philippines. Even a bottle of beer, or a meal, can cost less than 1 USD. The Filipino cuisine has Western and Oriental influences, which make it deliciously unique. Each region also has their different specialties. However, what you must not miss out on is the fresh seafood. Another convenient thing about traveling in the Philippines is that the language barrier is less likely to be a problem as a huge percentage of the population can speak and understand English. Last but not least, they say that the Filipino hospitality is incomparable. 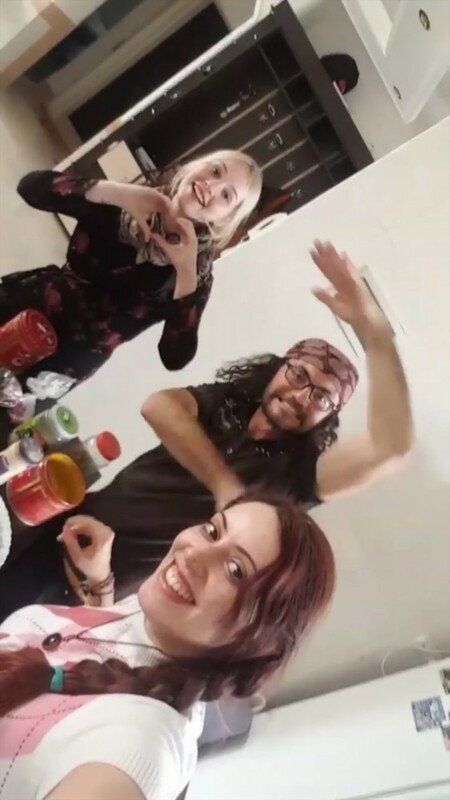 A lot of foreigners keep coming back to the Philippines, not just because of its natural wonders, but because of the friendly and welcoming people who make everyone feel like family. So did these 25 reasons to Travel the Philippines convince you to explore this tropical destination? I hope so because it will be worth every minute of your holiday. It was constructed in 1898 by a French architect as a luxury hotel and casino with the name Prinkipo Palace. However, the sultan at that time didn’t like the plan and eventually did not give the permission to operate a casino and hotel there. So it was sold in 1903 and bought by the wife of a prominent Greek banker, Eleni Zarifi. She donated the house to the orthodox church which operated it as an orphanage for Greek children. 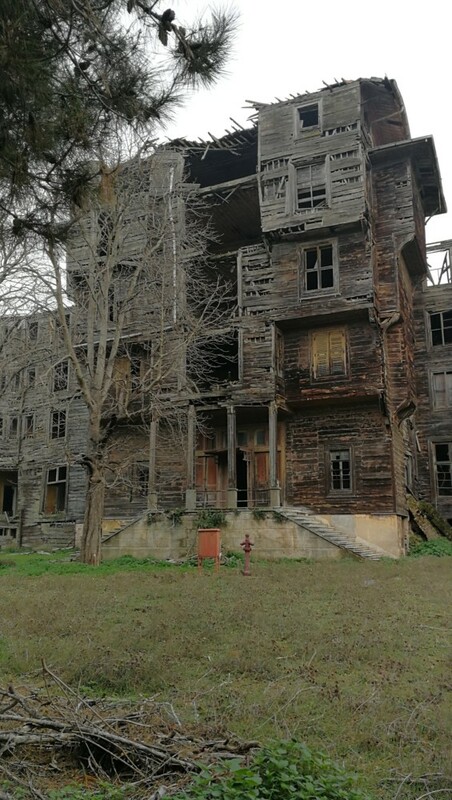 The house was built entirely using wooden materials and has 206 rooms, a large kitchen, a grand library, a primary school and various vocational schools. 15 people were employed in the orphanage and During the 60 years it catered to the needs of more than 5000 orphans. 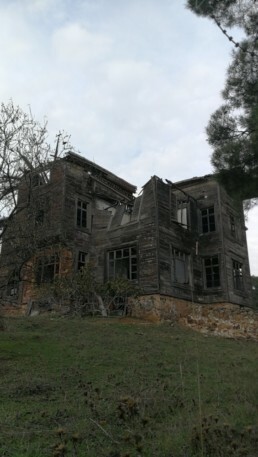 In 1964 during the Cyprus issue, the orphanage was forcefully closed and since then it’s decaying and abandoned. 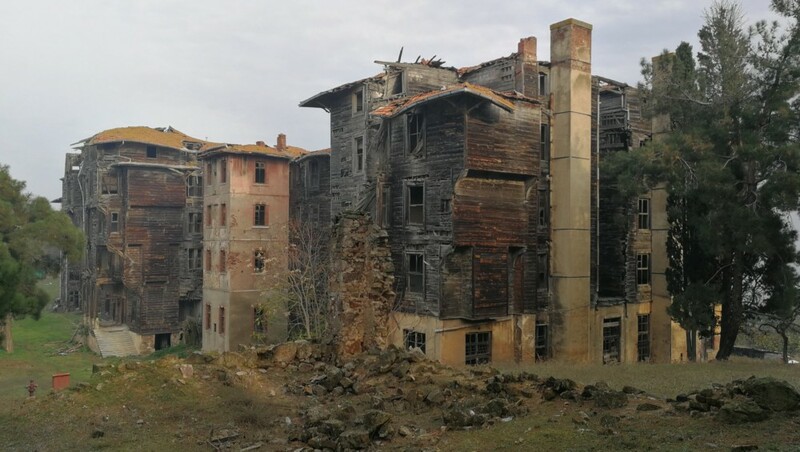 There are some legal disputes regarding the building and a lot of money is involved, but the condition of the building is already really really bad and it is to be hoped that the reconstruction will start before it’s too late. People say that there was a fire when the building served as an orphanage, And it is also told that some children burned during the fire. So there was a child that tried to escape and jumped into the well in the garden. In the searches that were made after the fire nobody was thinking about looking into the well and the child had no other choice than dying. 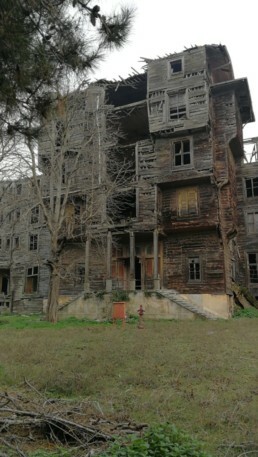 Nowadays the people of the island are still telling ghost stories about this place and they even claim that they occasionally hear children scream from the orphanage at night. It Is possible to visit the building from the outside but not permitted to get inside. However, getting there is quite easy when you are on the island anyway. As it’s located on a hill in the center of the island you can just walk there within 30 minutes from the harbour or take the bike or one of the horse carriages if you are really lazy. Once you’re there, there is a huge barb wire fence. It is not allowed to get inside of the building or the property as it’s falling apart and it’d be really dangerous. Anyway it’s already breathtaking to walk around the fence and look from the outside. I heard that it might be possible to get on the property by asking the people that actually live there and taking care of the building. But I haven’t tried it myself. It’s a really mystical place and the view of these wooden houses is pretty impressive. It’s a shame that legal disputes and ownership fights are in the way of rebuilding this unique place. It is just to be hoped that there will be a solution before the house will be destroyed forever. 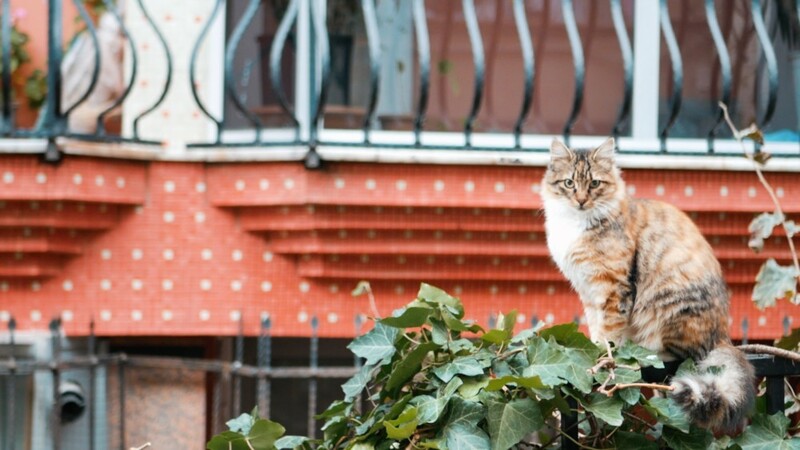 If you are a cat person Then this city is for you! 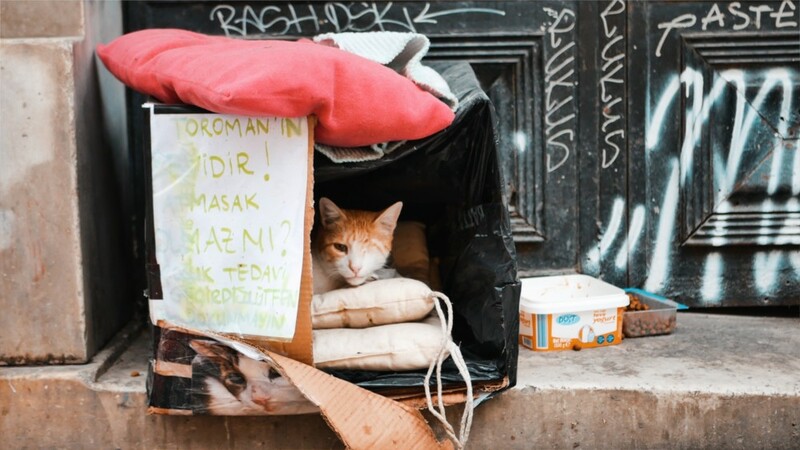 No matter where you are or what you do – in Istanbul you won’t be alone. Because cats are EVERYWHERE! 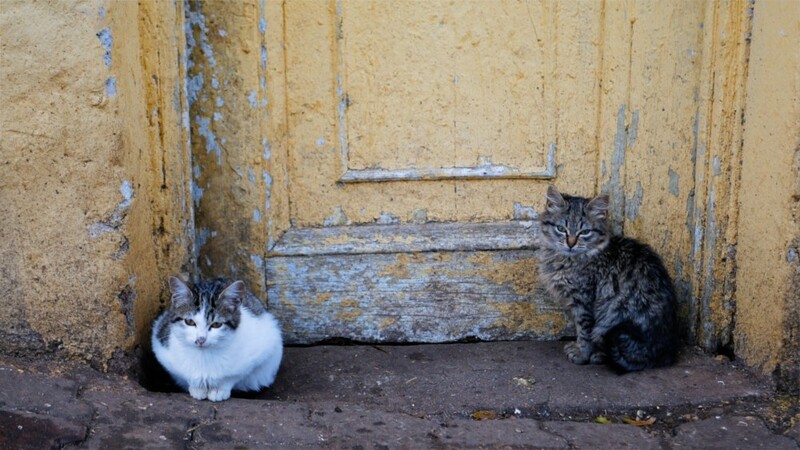 They are the kings and queens of the streets and everybody loves them! 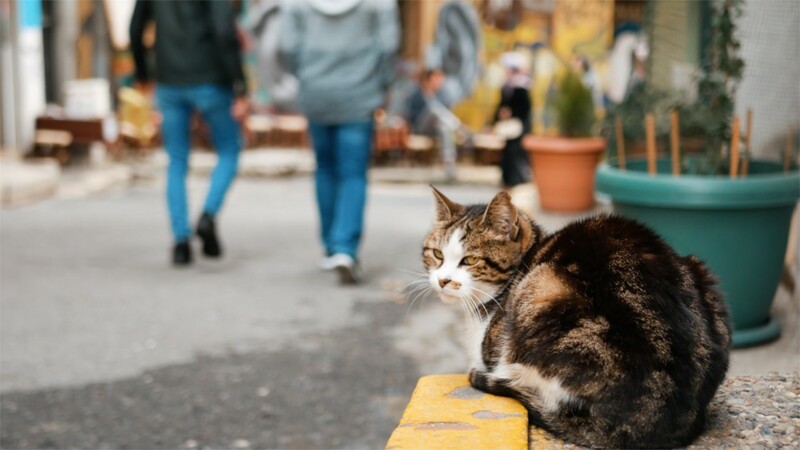 But why are there so many cats in Istanbul? 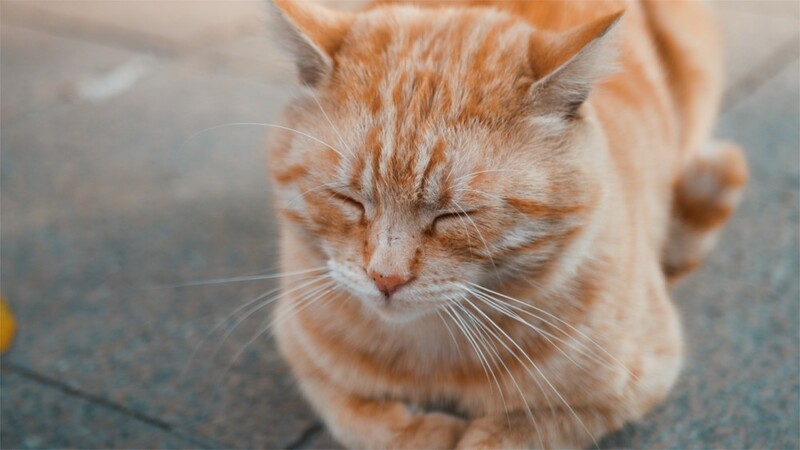 “If you kill a cat, you need to build a mosque to gain God’s forgiveness!” That’s what an Islamic legend says. And even today the locals are looking after them, feeding them and giving them shelter! No matter their religion. 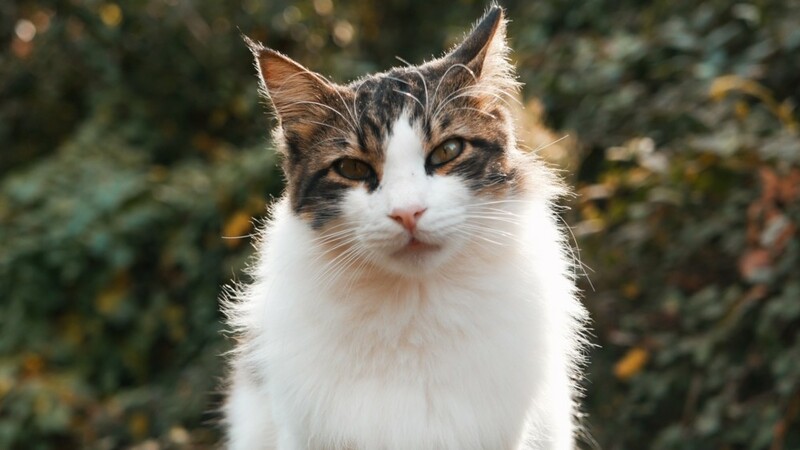 Most of the cats here seem lucky, but there is still a long way to go. 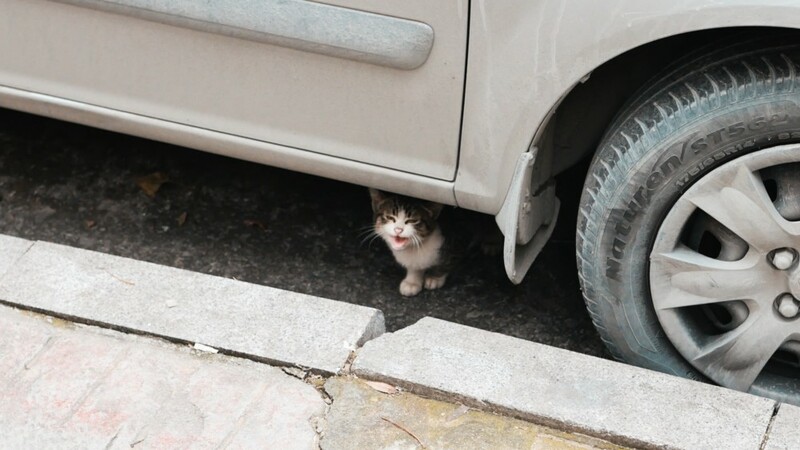 After all the streets are not designed for animals. 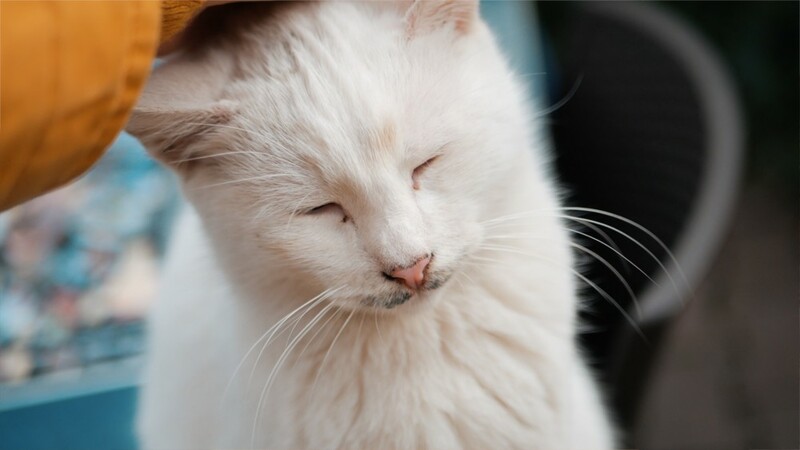 Volunteers invest their free time to look after injured cats, initiate spay & neuter programs and even organize fundraising events. 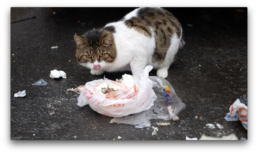 To give cats a better life. And this help will never stop. 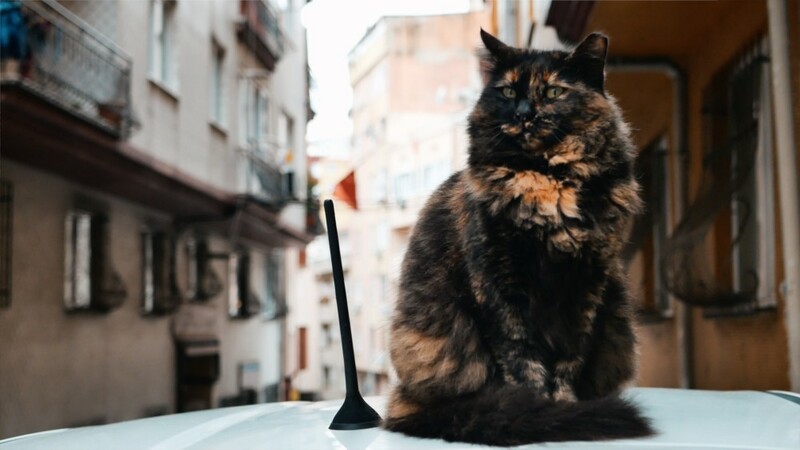 Istanbul is a great example of people, who selflessly dedicate their time and energy to street cats and an even better example that animals don’t need to be pets to be loved. 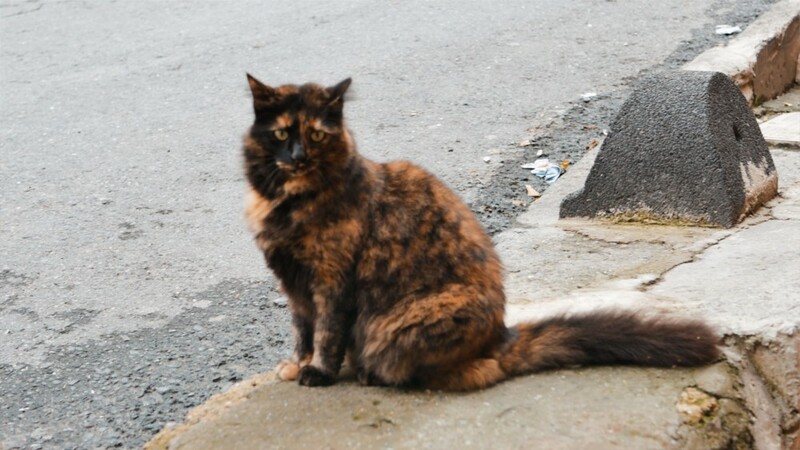 Wenn du ein Katzenliebhaber bist, dann ist das genau die richtige Stadt für Dich! 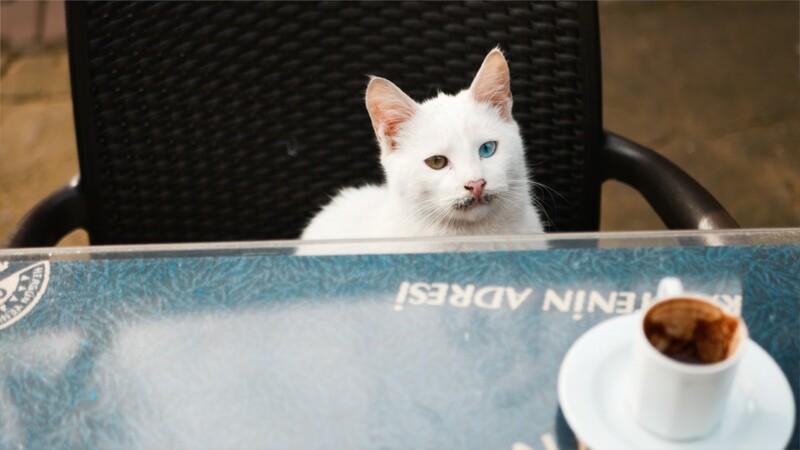 Egal wo man ist oder was man macht: in Istanbul ist man nie allein, denn Katzen sind ÜBERALL! Sie sind die Könige der Straße und jeder liebt sie. 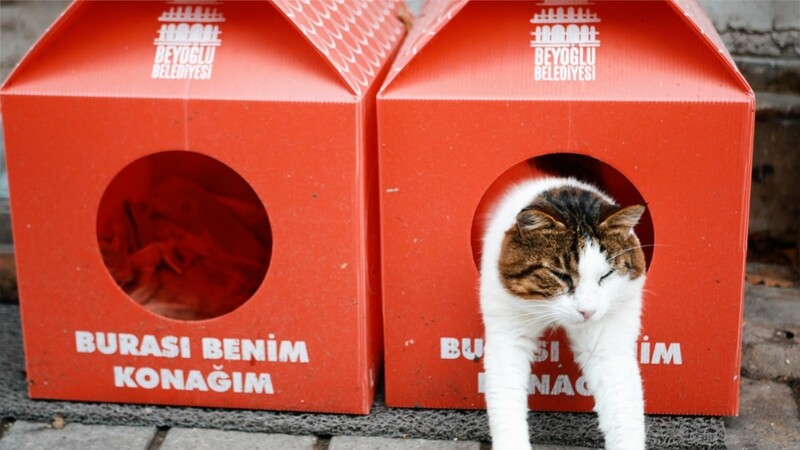 Aber warum gibt es so viele Katzen in Istanbul? 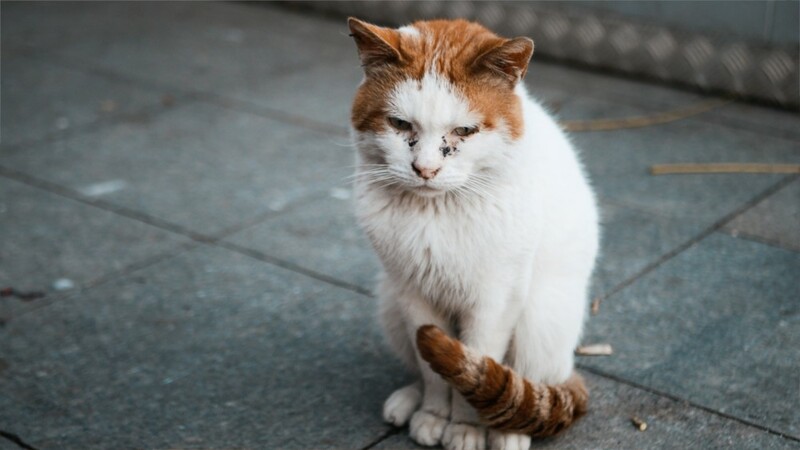 “Wenn du eine Katze tötest, so musst du eine Moschee bauen, um Gotts Vergebung zu erhalten” So lautet eine Legende aus dem Islam. Und auch heute noch kümmern sich die Menschen hier um ihre Katzen. Sie geben ihnen Futter und Unterschlupf! Ganz egal welche Religion. 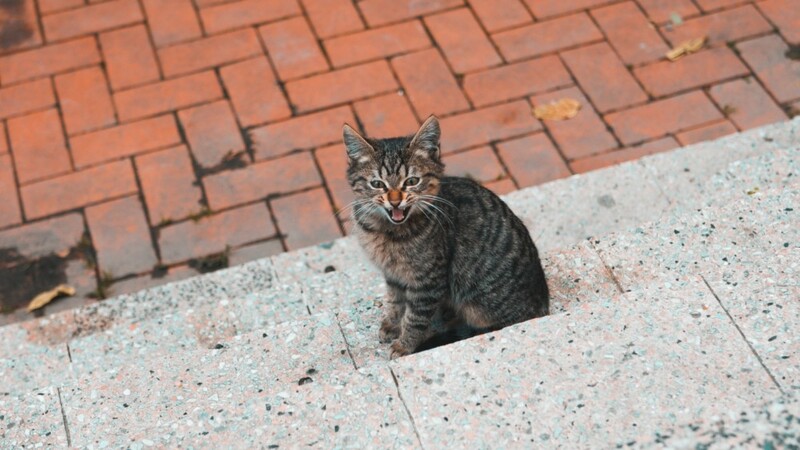 Die meisten Katzen hier haben wirklich Glück aber trotzdem gibt es noch eine Menge zu tun. Denn schließlich wurden Straßen nicht für Tiere gebaut. 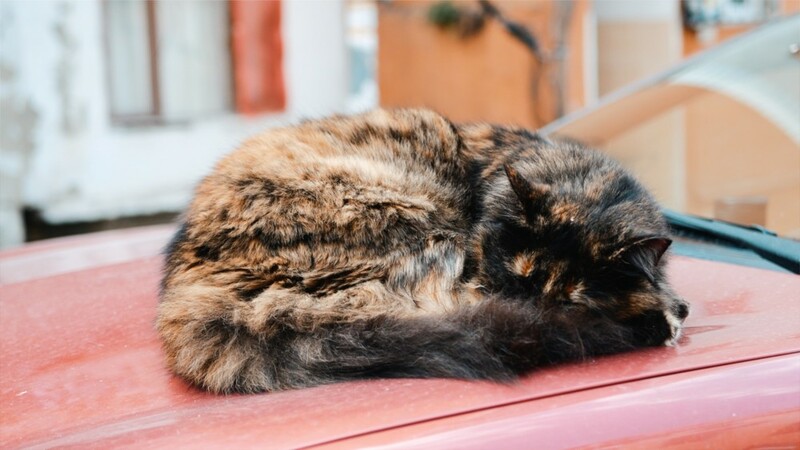 Freiwillige investieren ihre freie Zeit darin, sich um verletzte Katzen zu kümmern, veranlassen Kastrationsprojekte und organiseren Spendenevents, um Katzen ein besseres Leben zu ermöglichen. Und sie werden nie damit aufhören. 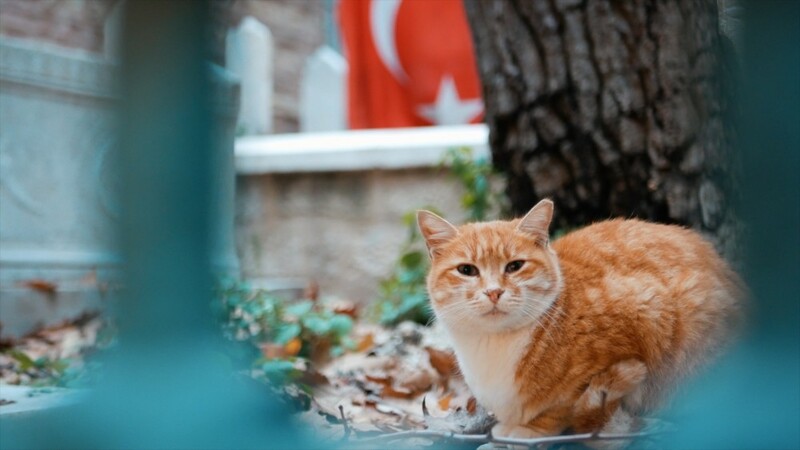 Istanbul ist ein tolles Beispiel dafür, wie Menschen ihre Zeit und Energie Straßenkatzen widmen und ein noch besseres Beispiel dafür, dass Tiere keine Haustiere sein müssen, um geliebt zu werden. Diesmal standen mir 4 volle Tage bevor, 2.500 km vom Nordkap bis nach Oslo: Alleine! So sehr wie ich es liebe zu trampen und das Abenteuer mit jemandem zu teilen, macht es genauso Spaß alleine zu trampen. Dieses Video ist Teil 2 meiner Reise per Anhalter durch Skandinavien. This time I was facing 4 full days of hitchhiking 2.500km from the North Cape down to Oslo: Solo! As much as I enjoy hitchhiking and sharing the adventure with a friend it’s also fun to hitchhike solo. This video is part 2 of my hitchhiking trip through Scandinavia. Ich liebe es, die ultimative Freiheit indem zu haben, was ich tue oder wohin ich gehen will. Auf dieser Reise traf ich echt tolle Menschen, die mich mitgenommen haben. Darunter waren z.B. zwei Blogger, die im Van mit ihrem Hund gelebt haben. Dann traf ich zwei Touriguides in Geiranger, mit denen ich Pilze sammeln gegangen bin und anschließend selbstgemachten Matetee in ihrem Wohnmobil getrunken habe. Eine polnische Familie hat mich auf eine Sightseeingtour durch Trollstigen mitgenommen und viele andere. Der lustige Teil war, als ich eine ukrainische Familie in Norwegen wiedergetroffen habe, die uns vor ein paar Tagen Tagen in Finnland mitgenommen haben! I love having the ultimate freedom to do whatever I want and to go wherever it takes me. On this trip I met really awesome people who gave me a lift including two bloggers living their life in a van with their dog, tourist guides from Geiranger who invited me to go picking mushrooms with them and drinking mate tea in their camper van, a polish family that took me on a sightseeing ride through Trollstigen and many more. The funny part was when I met again a Ukranian family in Norway who gave us a lift in Finland a few days ago! Ich entschied mich dazu, die längere aber schönere Route an der Küste entlang zu trampen. Und ich hätte mir niemals erträumen können, dass es so schön ist. Was ich auf jedenfall nochmal gelernt hab, war, dass man echt überall weg kommt. Auch 6 Uhr morgens am Nordkapp im Regen und Nebel. Oder im unendlichen Nichts von Norwegen. I decided to take the longer but more beautiful route along the coast. And I never imagined that it was THAT beautiful. What hitchhiking taught me again was that you really get a lift from everywhere. Even at 6am in the morning at the North Cape in rain and fog. Or in the middle of nowhere in Norway. Auch wenn ich schon einige Male alleine getrampt bin, ist es immer wieder eine neue Herausforderung für mich. Es ist nicht so, dass ich komplett sorgenlos bin, wenn ich mich dazu entscheide, zu trampen. Aber irgendwie überwiegt der Reiz, sich auf andere Menschen einzulassen, diese spontanen Momente zu erleben und an Orte zu kommen, die man sonst niemals sehen würde. Even though I’ve been hitchhiking alone a few times, it’s always a new challenge for me. It’s not that I’m completely fearless when I decide to hitchhike. But somehow it’s tempting to meet other people, experiencing these spontaneous moments and exploring places you would never see otherwise. In Norwegen zu trampen war besonders schön, weil man so viel auf einmal sehen konnte. Berge, Serpentinen, Wasserfälle, Schnee, Sonne, Meer. Ich wusste oft nicht, wo ich zuerst hinschauen soll. 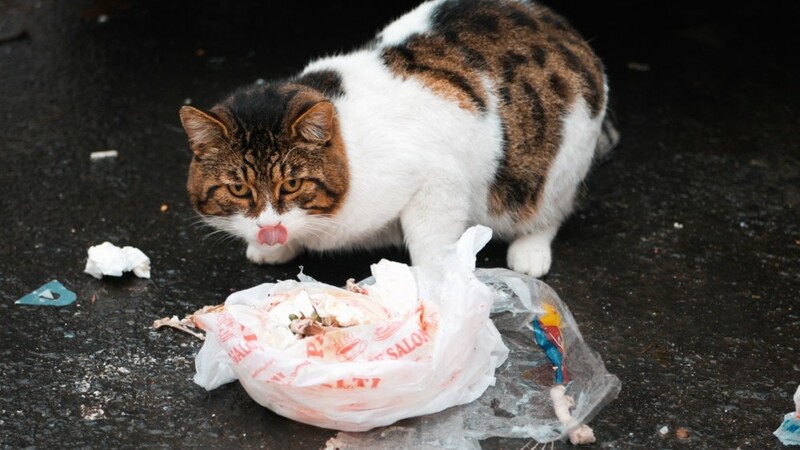 Mein Rat an alle, die allein trampen wollen: Geht raus, schnappt euch ein Stück Pappe, informiert euch vorher, vertraut eurem Bauchgefühl und streckt den Daumen raus. Hitchhiking in Norway was extra beautiful because there is so much to see. Mountains, serpentines, waterfalls, snow, sun, sea. I often did not know where to look first. My advice to everyone who wants to hitchhike solo: Go out, grab a piece of cardboard, educate yourself beforehand, trust your intuitions and thumbs up! Dieser Trip war besonders. Denn es ging es mit 15 anderen per Anhalter in den kalten Norden. Es soll erst ein Ende geben, sobald es nicht mehr weiter geht. Also ging es durch 7 Länder und 3500km Richtung Norden zum Nordkapp. Oder wie wir es nannten: Das Ende der Welt. Die Regeln waren einfach: 10 Tage Zeit und Per Anhalter bis zum Nordkapp. Der erste gewinnt. Unsere Ausrüstung? Ein Zelt, n Edding, Pappe und genug Instantnudeln. Und Geduld. Das wichtigste. Zusammen mit meinem Tramppartner, den ich zuvor nur aus FB kannte, ging es die nächsten Tage durch Polen, dem Baltikum und Skandinavien. This trip was special. Together with 15 others we hitchhiked towards the north. There will only be an end as soon as it does not go further. So we hitchhiked through 7 countries and 3500km to the North Cape. Or as we used to call it: the end of the world. The rules were simple: 10 days and hitchhiking to the North Cape. The first one wins. Our equipment? A tent, a permanent marker, a sign and lots of instant noodles. And patience. The most important thing. Together with my hitchhiking partner, whom I only knew from Facebook, we hitchhiked the next days through Poland, the Baltic States and Scandinavia. Wir haben stundenlanges Warten überstanden, mit anderen Trampern Bier getrunken, haben die kleinen Dinge geliebt, sind nachts gestrandet und von Fremden aufgenommen worden, Fahrer haben uns 100te Kilometer mitgenommen, wir haben uns dem wechselnden Wetter gestellt, neue Freundschaften geschlossen und vor allem: Nie aufgegeben. Wir haben so viel erlebt in den 7 Tagen, dass man das alles gar nicht in Worte wiedergeben kann. Unser Weg führte uns durch 7 Länder und war geprägt von langen Autofahrten, Begegnungen mit unglaublich netten Menschen und einem steten Wandel des Klimas und der Natur um uns herum. Ja, der Weg war das Ziel und er zeigte uns die schönsten Ecken des Nordens. Es ging nicht darum, am schnellsten am Ziel zu sein, sondern das Unmögliche möglich zu machen. Es ging darum, die Menschen 3.500km lang zu begleiten und was wir finden konnten, war Hilfsbereitschaft und Freundlichkeit und viel Vertrauen. We spent hours waiting, drank beer with other hitchhikers, loved the little things, got stranded at night and were taken in by strangers, drivers took us hundreds of kilometers, we survived the cold weather, made new friendships and above all: We have never given up. We have experienced so much in those 7 days that it’s impossible to put it in words. Our journey took us through 7 countries and was marked by long car rides, encounters with incredibly nice people and a constant change of climate and nature around us. Yes, the way was the goal and it showed us the most beautiful corners of the North. It was not about being the fastest and making it first, but making the impossible possible. It was about accompanying people for 3,500km and what we found was helpfulness and kindness and a lot of trust. Nach 7 Tagen und 28 Autofahrten waren wir dann endlich da. Nicht als erste, aber das war Nebensache. Es war kalt, windig und neblig- eben so, wie man sich das Ende der Welt vorstellt. Aber dieses Gefühl, als wir ankamen kann man einfach nicht beschreiben. Es war ein Mix aus Glücksgefühlen, Freude, Erleichterung und Ungebundenheit. Wir waren am Ziel und der zurückgelegte Weg war unser Abenteuer. Wir haben Menschen getroffen, denen wir nie begegnet wären, Orte gesehen, von denen wir nie geträumt haben und unzählige magische Momente erlebt. After 7 days and 28 car trips we were finally there. Not first, but that was a minor matter. It was cold, windy and foggy just as you imagine the end of the world would be like. But this feeling when we arrived can not be described. It was a mix of happiness, joy, relief and freedom. We made it and the journey was our adventure. We met people we would have never met, seen places we would have never dreamed of and experienced countless magical moments. We had reached our end of the world, but for me it was also the beginning of a new challenge: 2600km way back. Hitchhiking by myself through Norway. (To be continued). Viele verstehen nicht, wie man per Anhalter reisen kann. Aber wenn man erstmal da draußen steht und das erste Auto anhält, dann ist trampen viel mehr als nur stundenlanges Warten und die ganze Zeit im Auto sitzen. Was den Trip so unvergesslich gemacht hat? Die kleinen Dinge, die unterwegs die großen Glückmomente wurden und die das lange Warten vergessen lassen haben. Es ist einfach ein schönes Gefühl beim Trampen, dass direkt ohne langes Nachdenken ein gegenseitiges Vertrauen da ist. 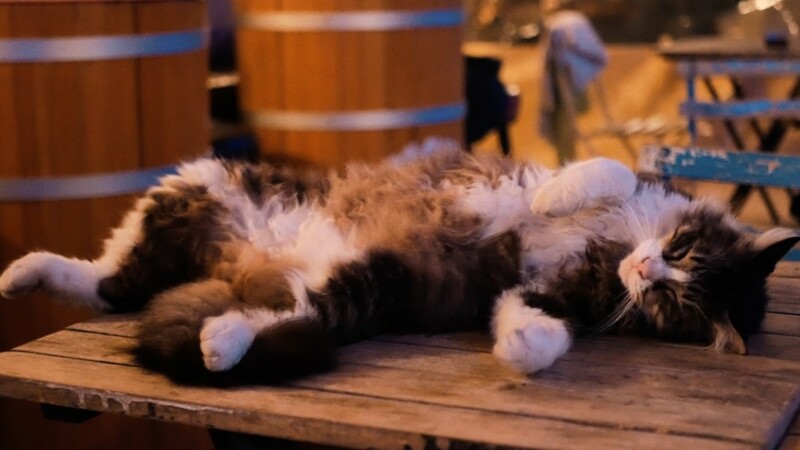 Der Trip war echt kein Zuckerschlecken, man weiß nicht wo man pennt, wann man das nächste mal duschen kann, ob man in der Nacht erfriert oder wann es mal kein Dosenessen zum Abend gibt. Aber wenn dann irgendwann dieser kleine magische Moment kommt, der alles andere um einen herum vergessen lässt und man einfach so dankbar für das ist, was man hat und dieses Glücksgefühl ist einfach unbeschreiblich. Many do not understand why people would hitchhike. But once you get out there and the first car stops, hitchhiking is much more than just waiting for hours and sitting in the car all the time. What made the trip so memorable? The little things that became the big moments of happiness on the way and which made us forget the long wait. It is just a nice feeling that there is a direct mutual trust without much thought between the driver and oneself. 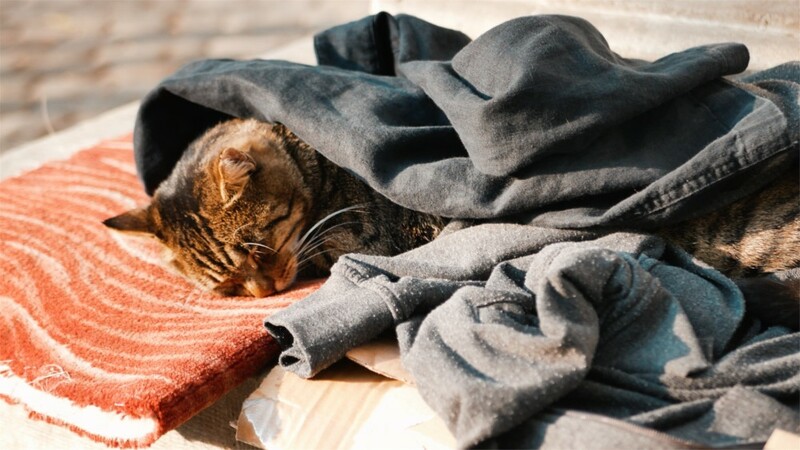 The trip was really tough: We did not know where to sleep, when we are able to shower the next time, were freezing during the night and had a lot of of instant noodles. But at some point comes that little magical moment that makes you forget everything around you and you’re just so thankful for what you have and that happiness is simply indescribable. Wir waren zu 100% auf die Hilfe fremder Menschen angewiesen. Mit einem Zelt und einer Menge Instantnudeln im Gepäck haben wir nicht nur den Norden, sondern auch uns selbst entdeckt. Nach 7 Tagen und der Hilfe von 28 Autofahrern hatten wir es endlich geschafft und unser ernanntes Ende der Welt erreicht. Es war kalt, windig und neblig- eben so, wie man sich das Ende der Welt vorstellt. Aber wir hatten uns und eine Menge Geschichten, die erzählt werden mussten. Per Anhalter zu reisen ist eine sehr eigene Art des Reisens und verlangt einem eine Menge an Geduld und ruhigen Nerven ab. Aber noch nie zuvor habe ich mich so frei gefühlt. Man trifft Menschen, die man nie treffen würde. Man sieht Orte, die man nie erreichen würde, man schließt Freundschaften, die nie entstanden wären und vor allem, wird man Teil vieler kleiner Reisen und schreibt seine eigene große verrückte Geschichte. We were 100% dependent on the help of strangers. With a tent and a lot of instant noodles in our luggage, we discovered not only the North but also ourselves. After 7 days and the help of 28 drivers we finally made it and reached our designated end of the world. It was cold, windy and foggy just as you imagine the end of the world. But we had each other and a lot of stories that needed to be told. Hitchhiking is a very special way of traveling and requires a lot of patience and calm nerves. But never before have I felt so free. You meet people you would never meet. You see places you would never reach, you make friendships that would never come up, and most of all, you become part of many small trips and write your own big crazy story. I started making videos when I was 12 years old and never stopped running around with a camera in my hand since then. My passion for traveling and discovering new places made me realize how beautiful this world is and that we all should capture it! The unfortunate thing is that sometimes you don’t really know what your passion is or how to follow your dreams. Don’t worry, one day you’ll figure it out. I figured it out after 12 freaking years. Becoming a travel video creator is a process that takes a lot of time and doesn’t happen over night. It’s like a big puzzle and step by step you’ll see what the big picture is all about. I knew that I wanted to become a filmmaker when I was in high school. So I applied for a film school, got rejected and entered the world of business and sales instead. An industry that made me feel miserable, but save. I earned money and knew that I’d always get a job. So what was my problem? And believe me, to change what you love is very very hard. But I tried. And it made me feel the worst I ever felt in my life. Doing something you don’t love changed me to a person that was unhappy with life, unmotivated to do anything and tired. All. The. Time. I had to quit my job. Move away from Germany. Leave everything behind me. And just concentrate on myself. And finally do what I love. Even if that means that I have to take that road alone. Where this journey will take me? I don’t know. Nobody knows where they will end up. But if we risk nothing, then we risk everything. So let’s go on adventures out there and let’s create content that makes us remember our life. If we never try, we’ll never know.